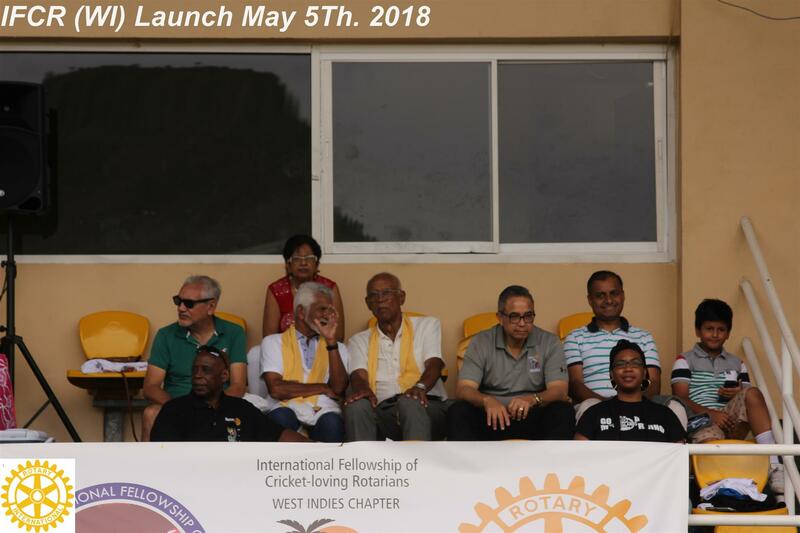 Saturday 05th May 2018 was a historic day for cricket loving Rotarians of the West Indies and spectators who gathered at the Queen’s Park Oval Port of Spain for the Launch of the International Fellowship of Cricket Loving Rotarians West Indies Chapter (“IFCR-Windies”). 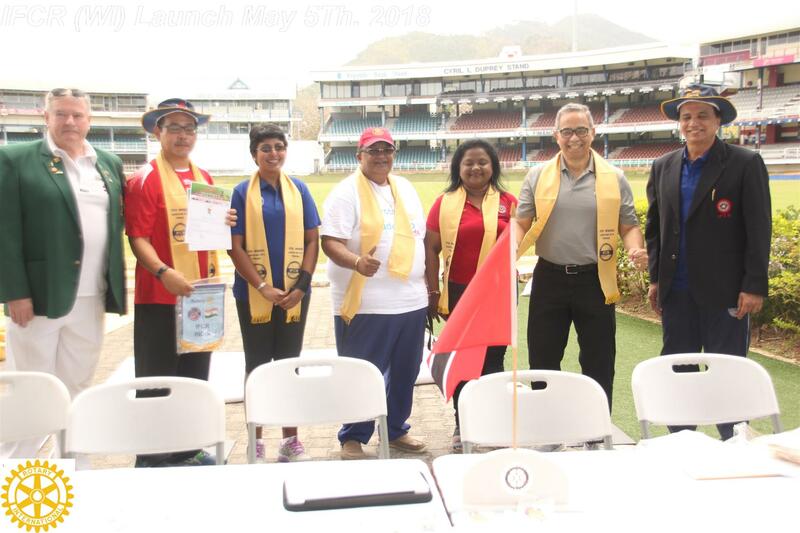 The IFCR-Windies will comprise Rotarians of the West Indies (Rotary District 7030) who are passionate about the game of cricket and are interested in its promotion throughout the District. The charter certificate was presented to the local board by Chairman of IFCR- World, Rotarian Bob Brigden of Australia and Secretary of IFCR-World, Rotarian KR Parthasarathy of India. 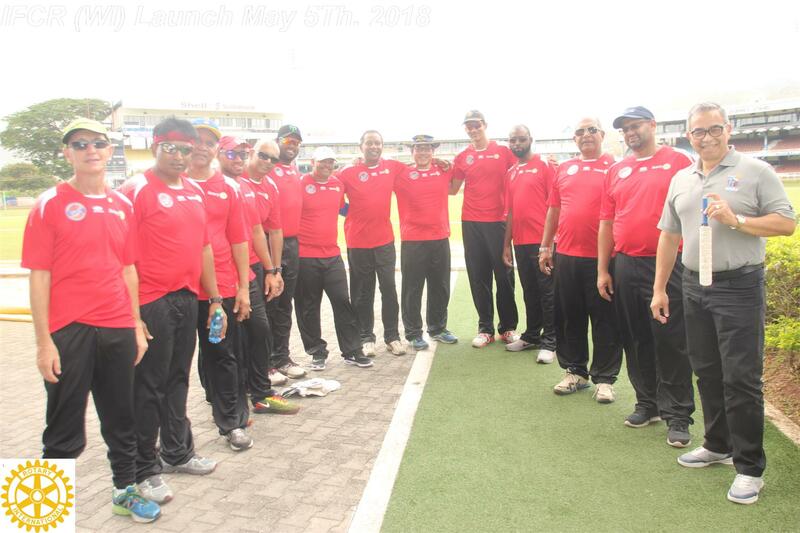 The first cricket match of the day involved cricket loving Rotarians who had travelled from Australia, Sri Lanka, India and England playing against local Rotarians in a fun filled match that ended in a draw. 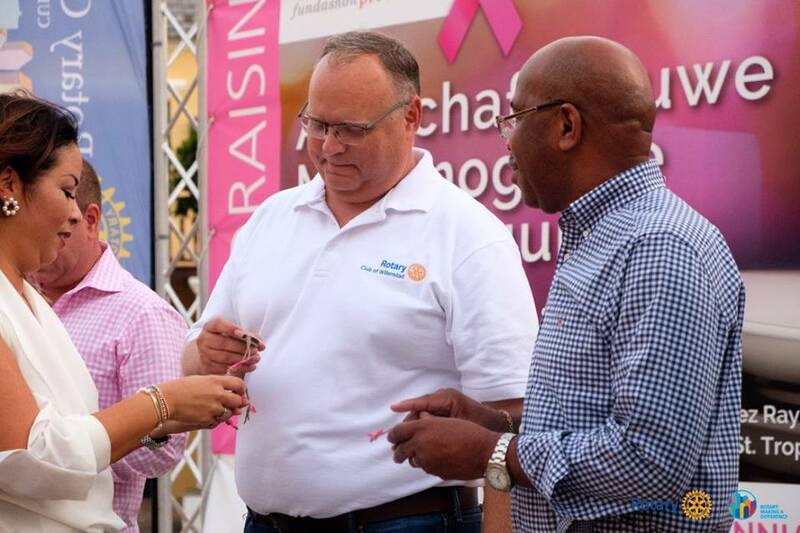 WILLEMSTAD – Rotary Clubs announced their support for a new mammography device for the Prevention Foundation or Fundashon Prevenshon (FP)yesterday, during the start of the Rotary Walking Dinner. 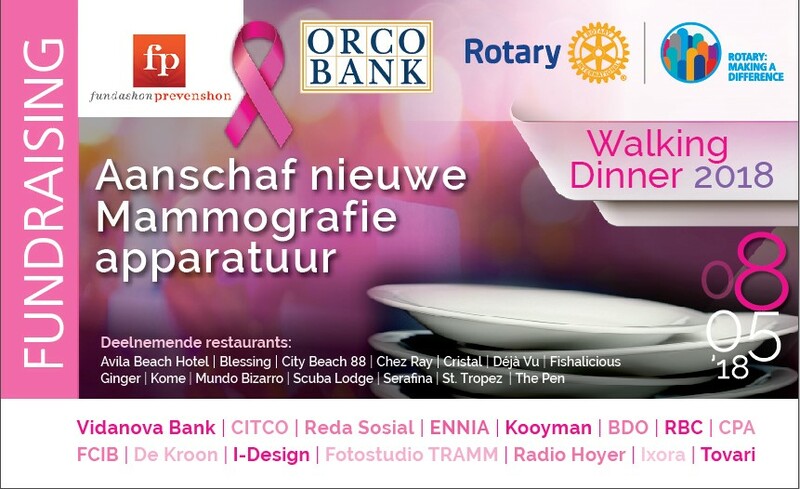 Orco Bank, both Rotary Club of Willemstad & Curaçao, the Princess Wilhelmina Fund against Cancer (PWF), The Rotary Foundation and a number of other sponsors will join forces to help Fundashon Prevenshon to create a new mammograph. After almost 9 years, the current mammography device has reached the end of it’s life-cycle and FP wishes to make use of new innovative technologies available. The wish of FP is to acquire a Digital Breast Tomosynthesis (tomo) device, also known as 3D mammography. This revolutionary technology allows for faster and more accurate mammographies with less exposure to radation in comparrison to a 2D mammogram. The device is also safer and less invasive for customers. 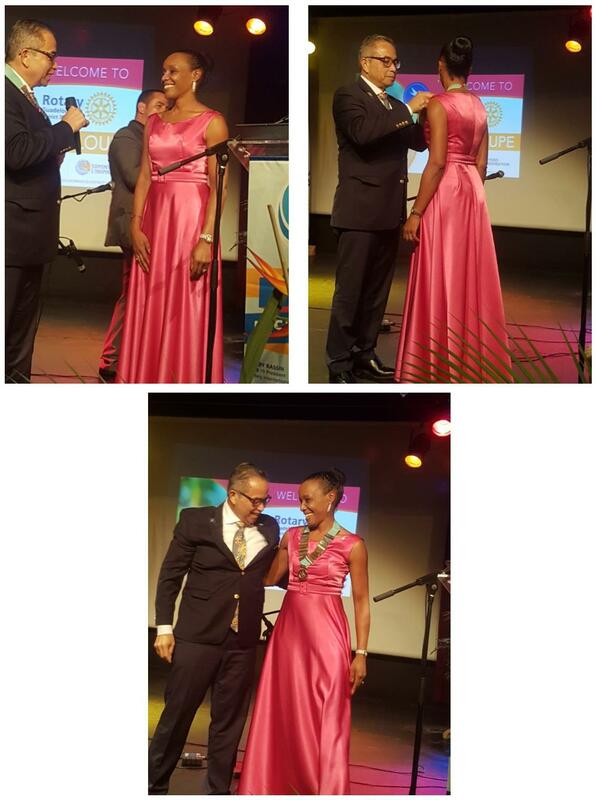 On Tuesday May 8th, Rotary Club Willemstad (RCW) held her 4th annual Walking Dinner. 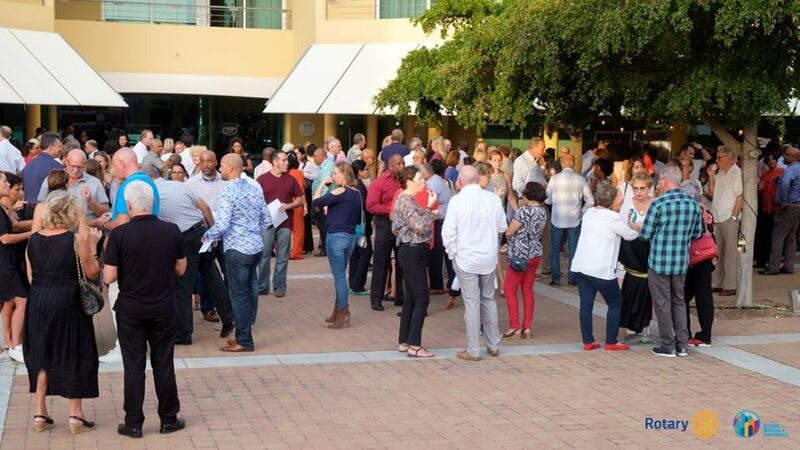 An estimated 450 people particapted in this culinary fundraiser. The evening started from the historic Octagon Square at the Avila Beach Hotel, where all participants were treated to a glass of bubbly and an appetizer. 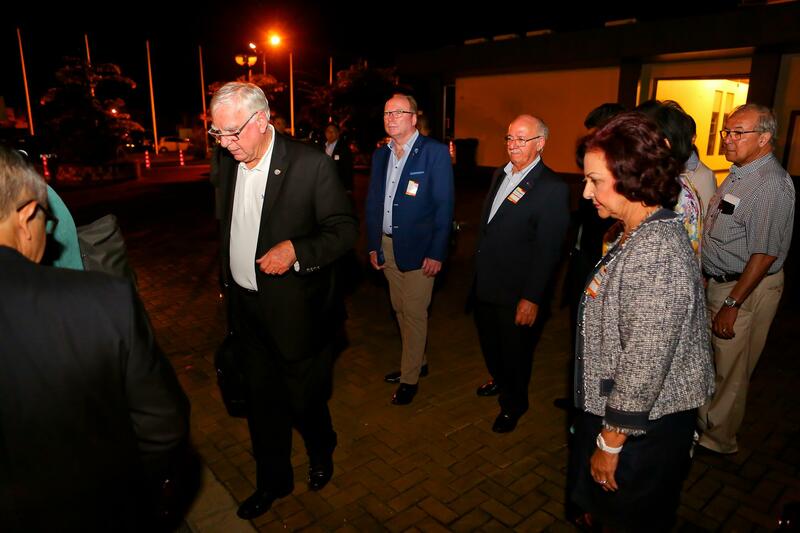 After an official kick-off, everyone received their personal dinner route to the various restaurants in the Pietermaai of Willemstad. The Walking Dinner finish was at City Beach 88 were a Pink Lady cocktail and a commemerative token of appreciation were received by all. 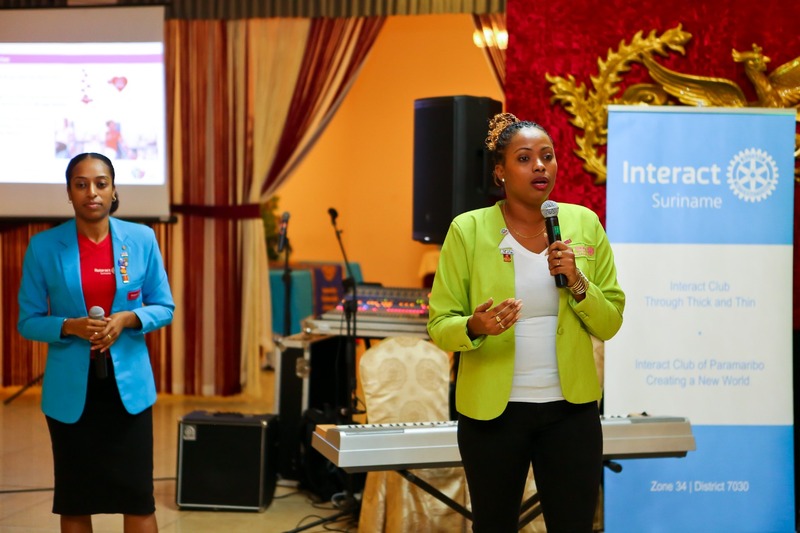 With this unique fundraiser, RCW contributed more than US$ 20,000 to the 3D mammography device. Masha Danki! Thank you! Merci! 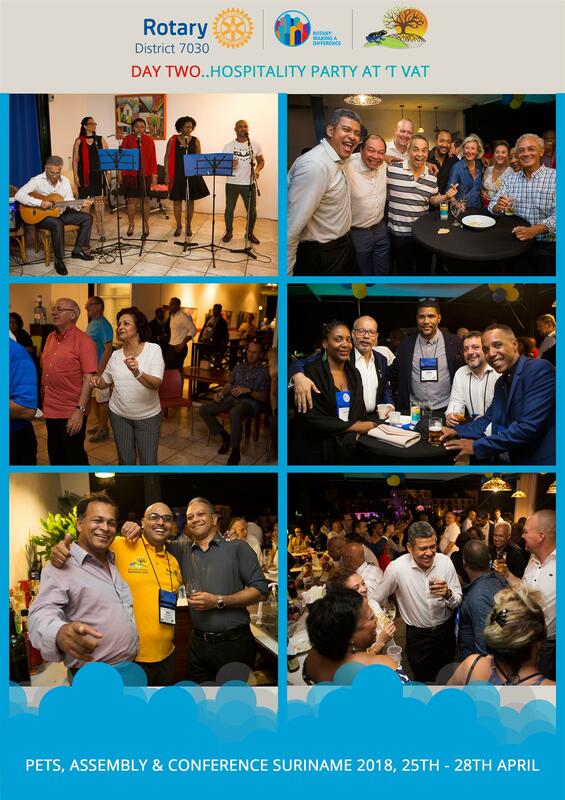 Rotary Club Willemstad wishes to extend a heartfelt thanks all sponsors, participants and restaurants that have made this wonderful evening possible. 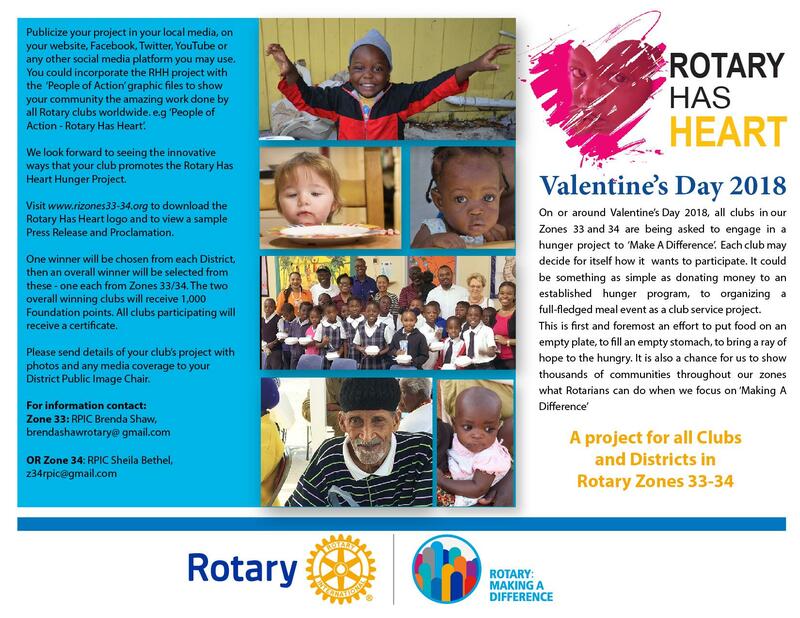 If you, or your company, wish to received more information on how you can help to complete this project, please send an email to rotarywalkingdinner@gmail.com for more information. World Immunization Week, 24-30 April, is a great opportunity to help spread the word that #VaccinesWork and are critical to preventing and ending diseases, like polio. Immunizations can save as many as 3 million lives a year and is one the most cost-effective healthcare tools, according to the World Health Organization. Vaccines help people all over the world live healthy lives. Did you know that through immunization Rotary and its partners have helped protect more than 2.5 billion children worldwide from polio? In addition, the “plus” in PolioPlus helps support a range of additional health and humanitarian interventions for other disease initiatives, such as measles and tuberculosis. 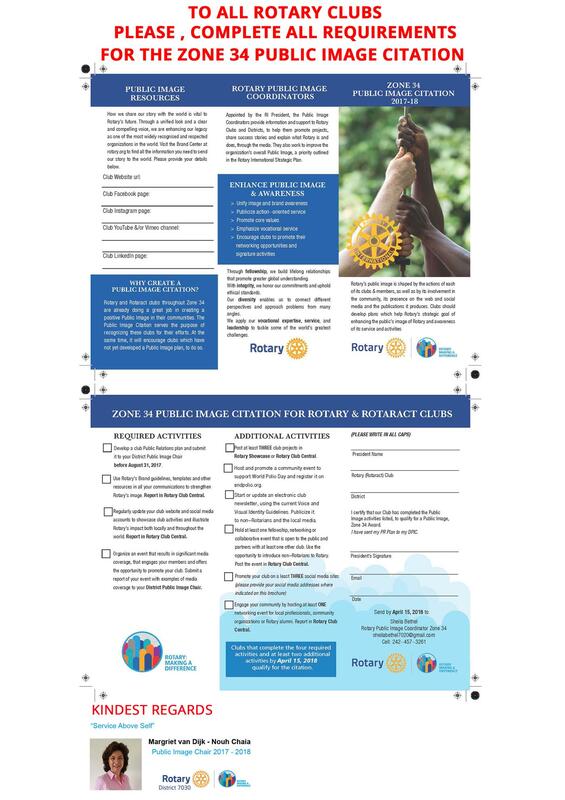 Use this article at your next meeting to discuss how your club can get more involved in Rotary’s global priority. Encourage your members to follow End Polio Now on Facebook and Twitter for the latest polio eradication news. 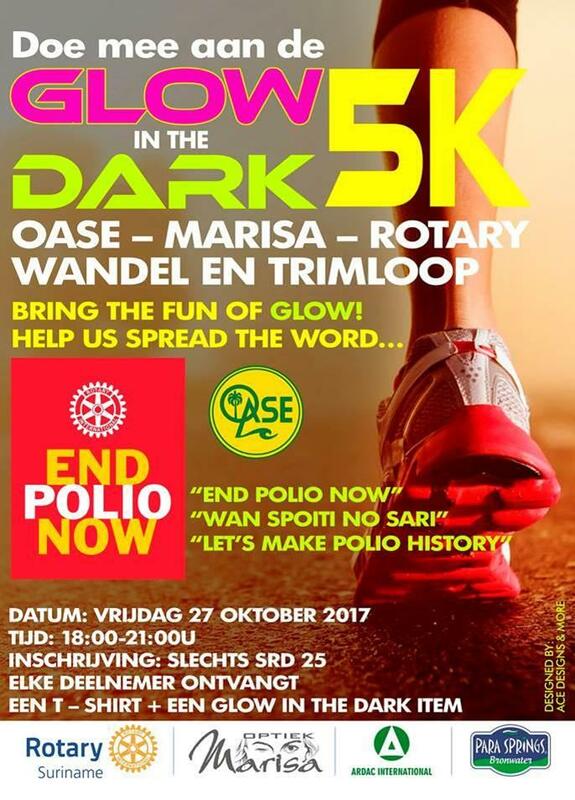 World Polio Day may seem far away, but it’s never too early to begin planning your activity for 24 October! 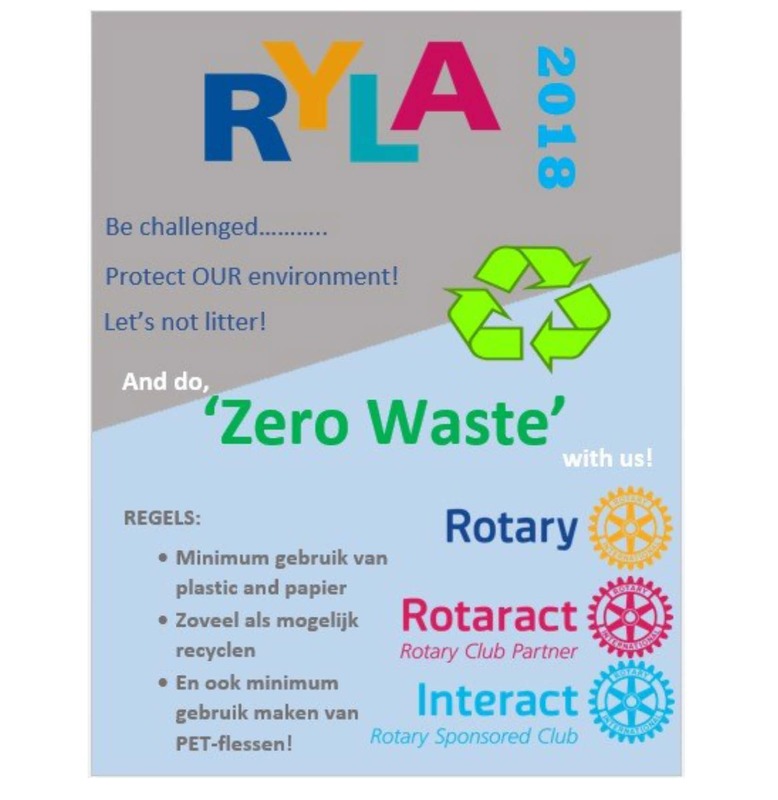 Last year, a record number of Rotary clubs registered their events, and we are planning an even bigger splash for 2018. Looking for inspiration? 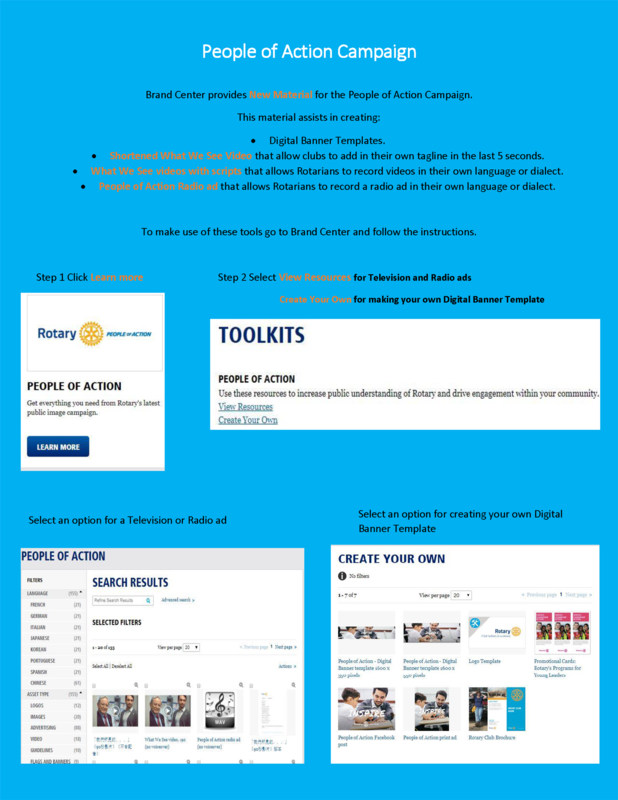 Visit the Resource Center for videos, educational materials, and event tools to get started. 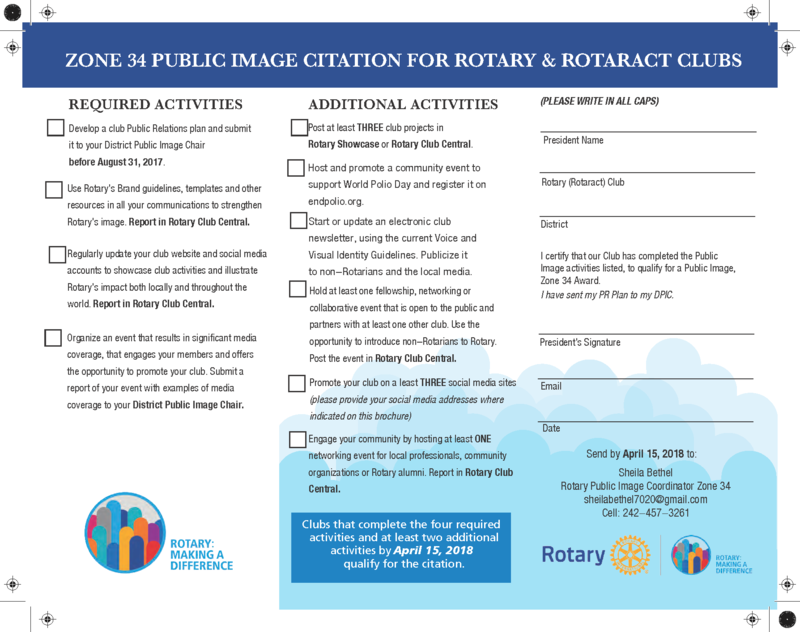 Virtual reality (VR), Rotary’s latest club resource, is a great tool to add to your World Polio Day event. Through VR, viewers can see firsthand how together we end polio. Rotary is developing a suite of resources to help clubs integrate VR into a club event, but in the meantime, experience VR for yourself. 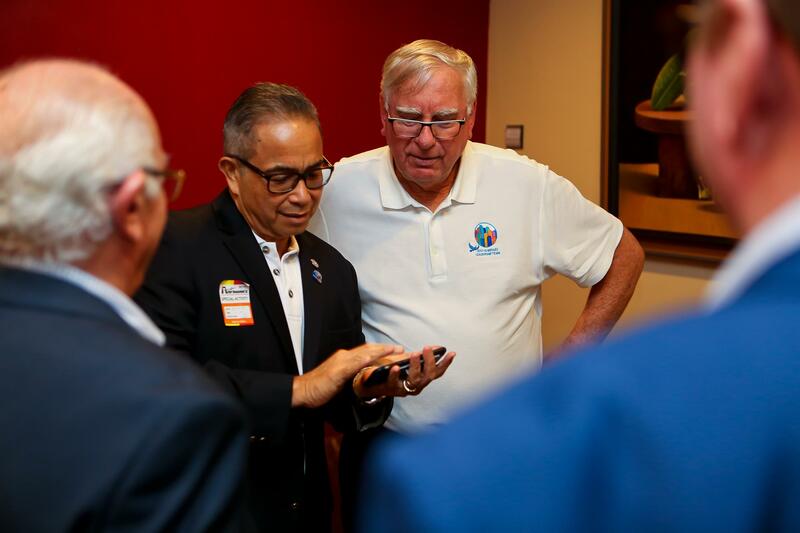 Download the Rotary VR app to your smartphone device from the Apple App Store or Google Play. Donations to PolioPlus support vaccinations, surveillance, and outbreak response — three key elements to helping end this disease for good. Thanks to your generosity, we are working to raise $50 million per year over the next three years in order to unlock a 2-to-1 match from the Bill & Melinda Gates Foundation, announced last year at the Rotary International Convention. 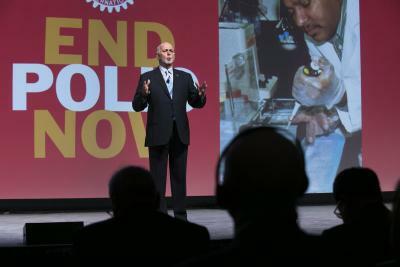 Rotary clubs are encouraged to give $1,500 or more to polio each year. Districts can also allocate 20% of their funds to the cause through District Designated Funds (DDF). And here’s how to give as an individual. Show how your Rotary club is a part of a global effort to immunize the world’s children by using #endpolio and #vaccineswork in your social media posts. Use these templates to tailor your social media messages. Reach out to local media during World Immunization Week to share your club’s involvement in the fight against polio. If you need help starting this conversation, talk to your regional public image coordinator. 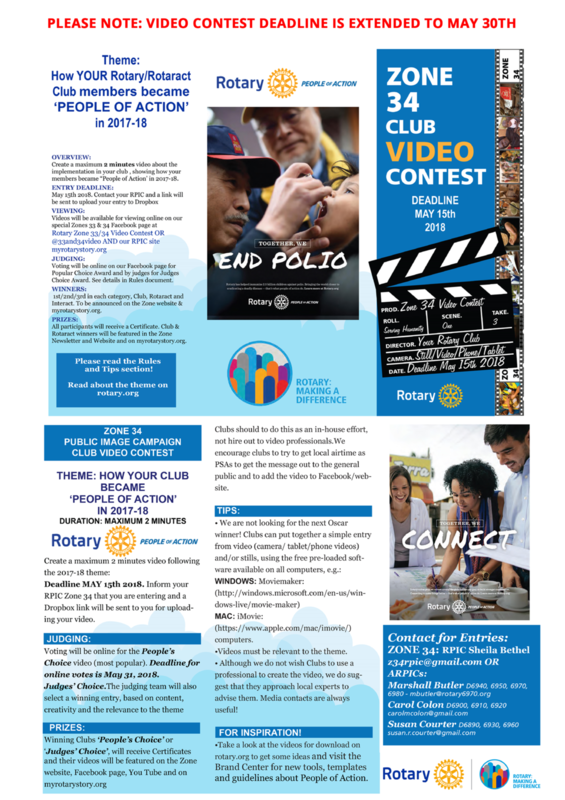 Be sure to tell us about what your club is doing to help end polio so we can share your work with readers around the world. 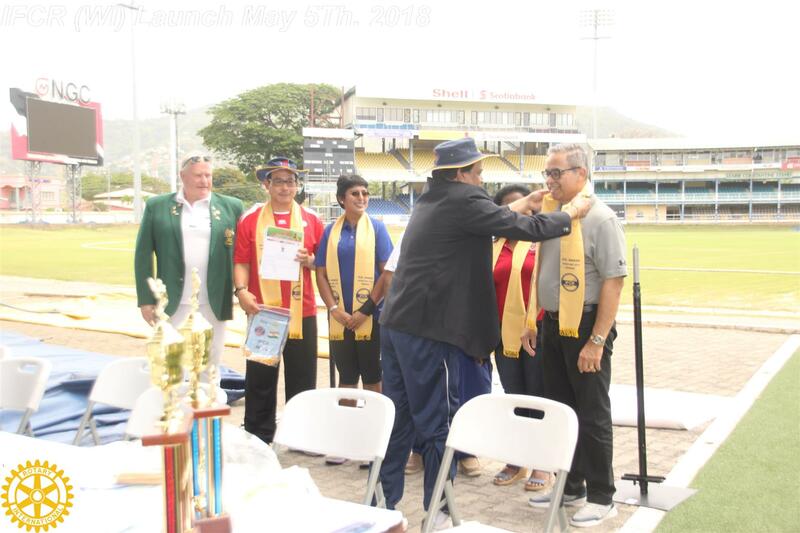 The Rotary Club of Port of Spain (RCPOS), in conjunction with the Ministry of Education, Government of the Republic of Trinidad and Tobago, hosts an annual athletics meet for students of Primary Schools in the Port of Spain educational district. This year was RCPOS’s 30th anniversary of hosting the games. Many national level athletes were scouted at these games over the years including Olympians Michelle Lee-Ahye and Jehue Gordon. 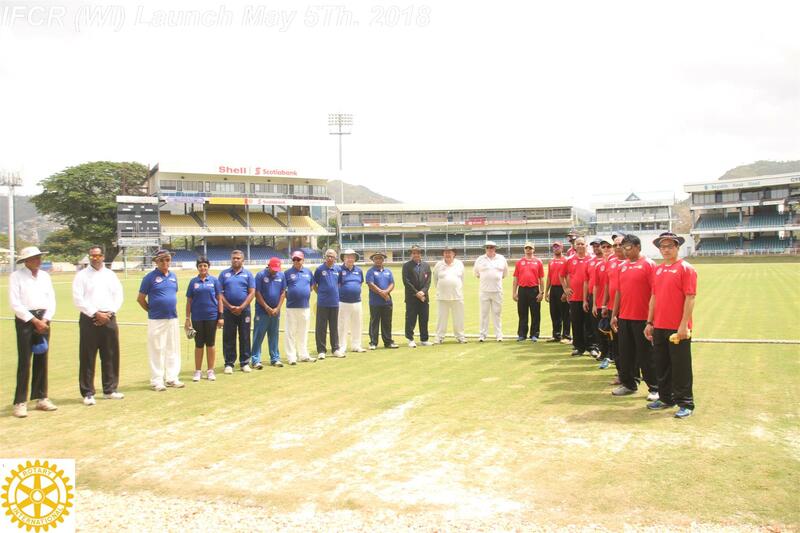 Prior to the games, RCPOS hosts a media launch to introduce the games to the media to help drive coverage of the actual event and to raise awareness of the young athletes of our community and the country. 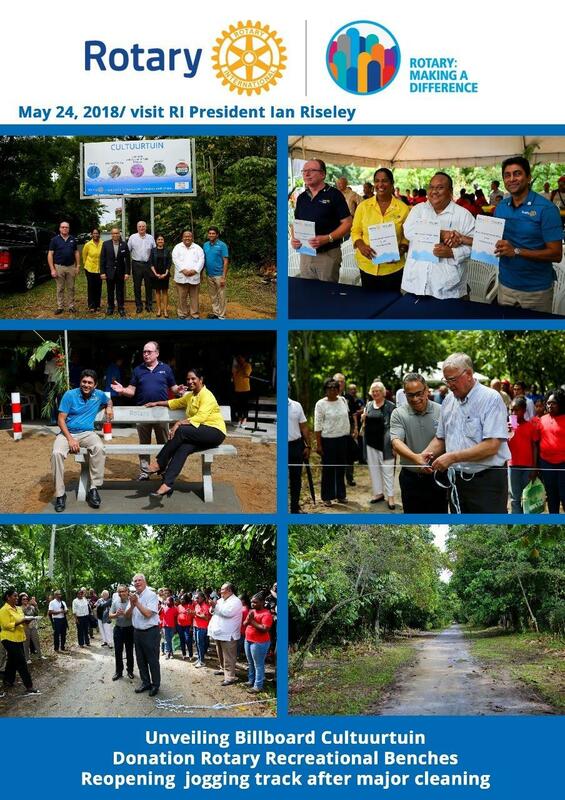 At this year’s launch, hosted during our weekly luncheon at Goodwill Industries, RCPOS had media from many of Trinidad’s media houses including the Guardian Media Group and Newsday newspapers. 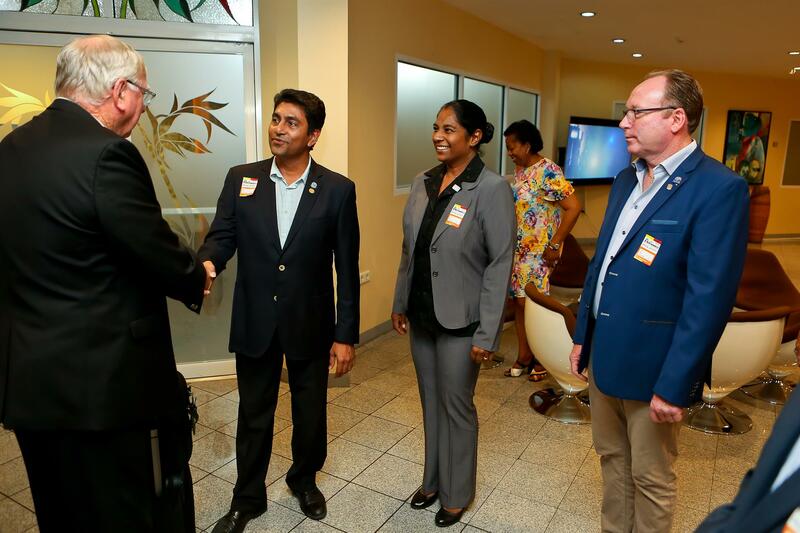 RCPOS spoke extensively at this event about the Club’s longstanding relationship with the games and the role that athletics plays in shaping the young persons of the country. We also spoke about Rotary as a whole and explained some of the Rotary traditions for our sponsors and media in attendance. 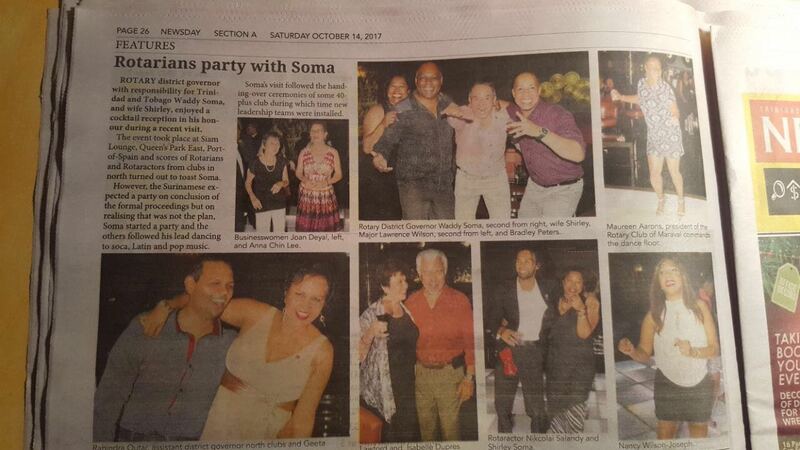 The event and the games themselves generated significant press coverage in Trinidad’s 3 daily newspapers. Examples of this coverage can be found below. 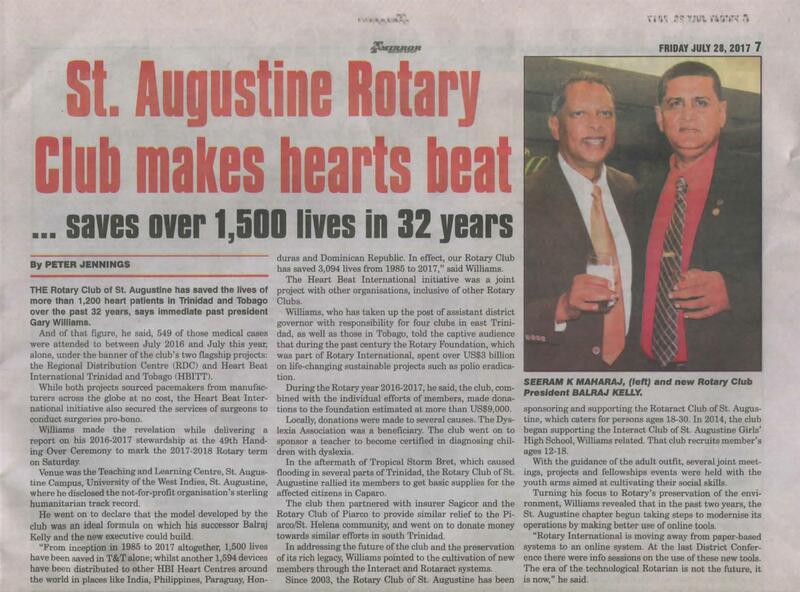 THE Rotary Club of St Augustine has saved the lives of more than 1,200 heart patients in TT over the past 32 years, says immediate past president Gary Williams. 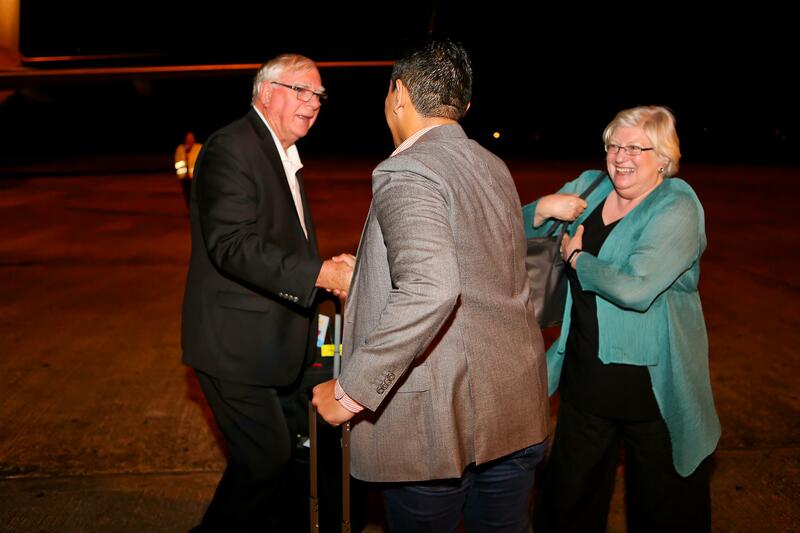 Of that figure, he said, 549 of those medical cases were attended to between July 2016 and July 2017, under the banner of the club’s two flagship projects: the Regional Distribution Centre (RDC) and Heart Beat International Trinidad and Tobago (HBITT ). While both projects sourced pacemakers from manufacturers across the globe at no cost, the Heart Beat International initiative also secured the services of surgeons pro-bono, said a media release. 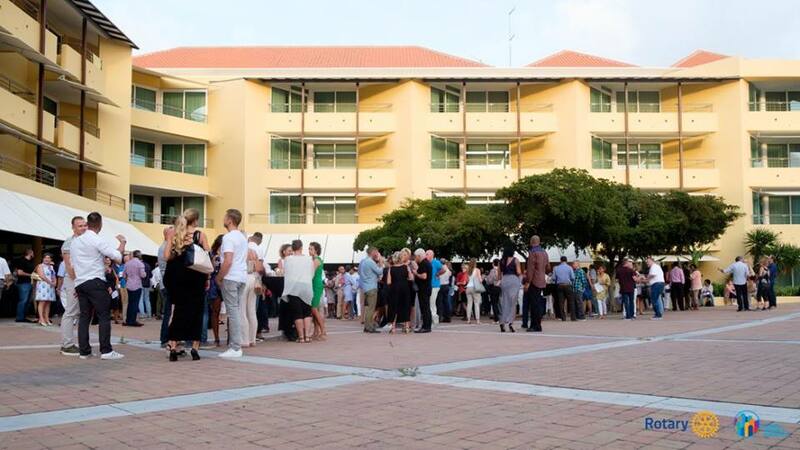 Williams recently disclosed this success at the 49th Handing Over Ceremony to mark the 2017-2018 Rotary term at the Teaching and Learning Centre, The University of the West Indies, St Augustine. 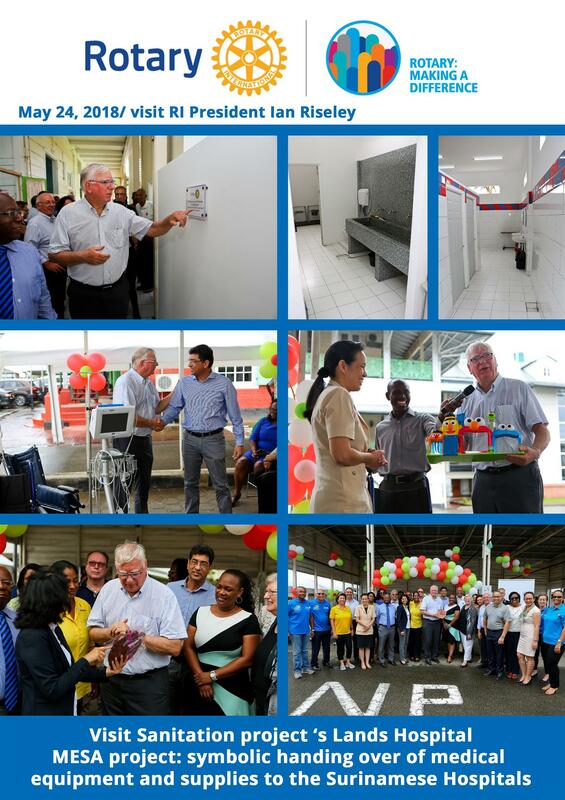 “From inception in 1985 to 2017 altogether 1,500 lives have been saved in TT alone; whilst another 1,594 devices have been distributed to other HBI Heart Centres around the world in places like India, Philippines, Paraguay, Honduras and Dominican Republic. 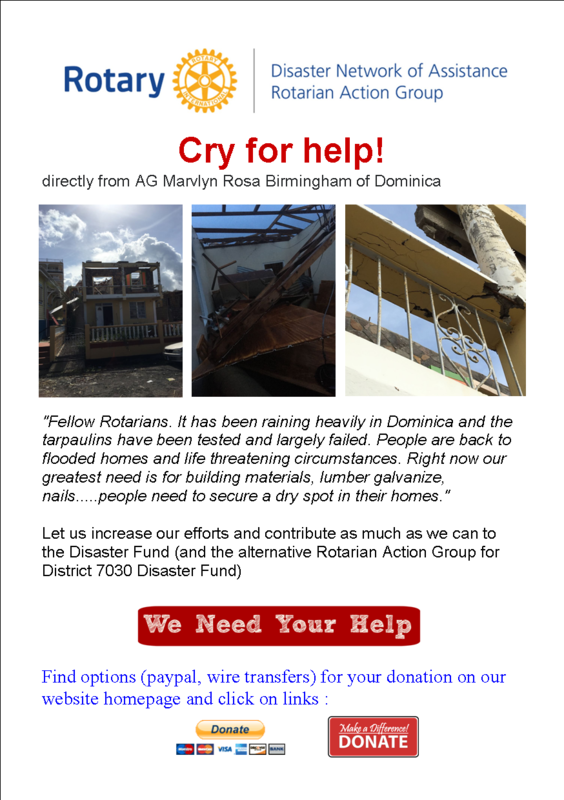 In effect our Rotary Club has saved 3,094 lives from 1985 to 2017,” Williams said while reporting on his 2016-2017 stewardship. 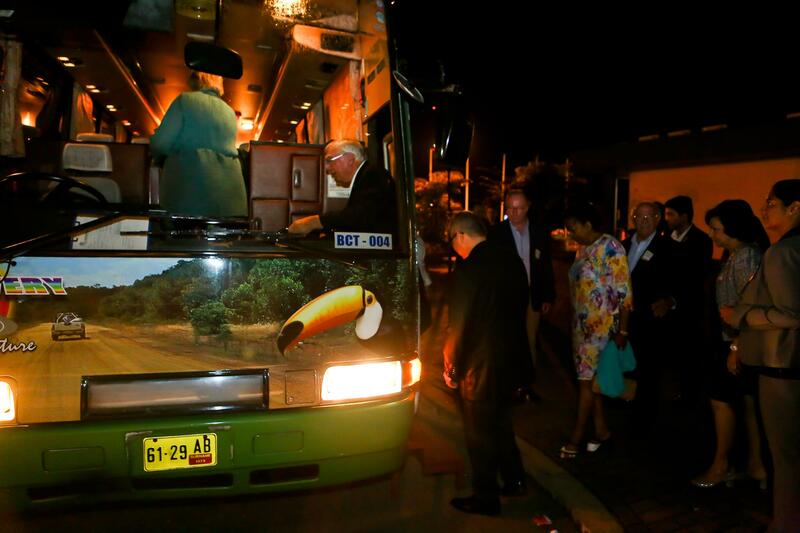 The Heart Beat International initiative was a joint project with other organisations, inclusive of other Rotary Clubs. 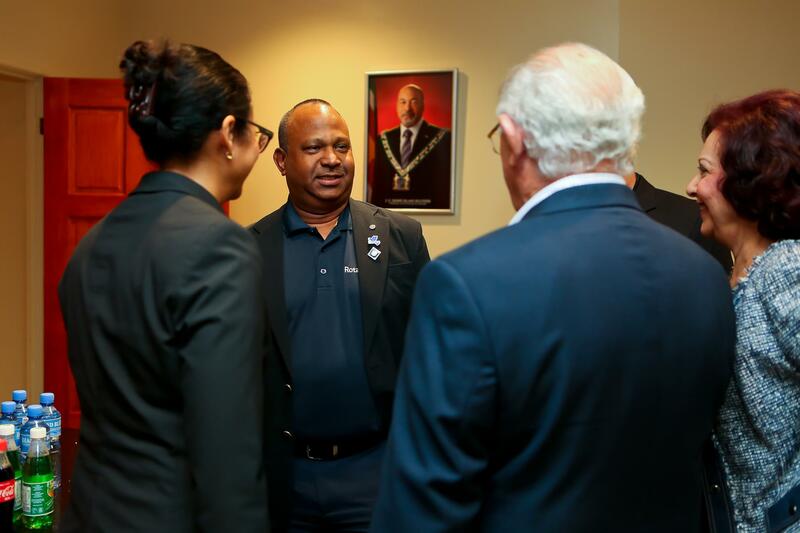 Williams, who has taken up the post of assistant district governor with responsibility for four clubs in east Trinidad, as well as those in Tobago. 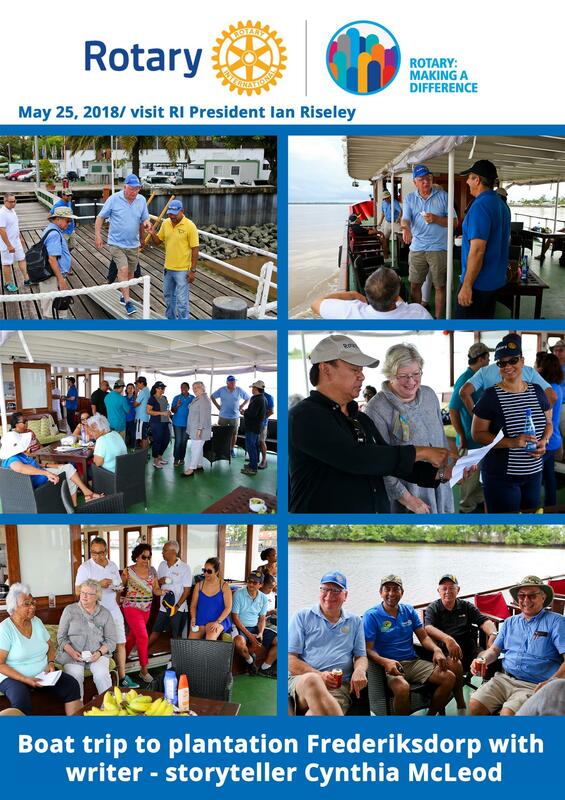 During the Rotary year 2016-2017, he said, the club combined with the individual efforts of members made donations to the Rotary Foundation estimated at more than US$9,000. Locally, donations were made to several causes including The Dyslexia Association the sponsoring of a teacher to become certified in diagnosing dyslexia. 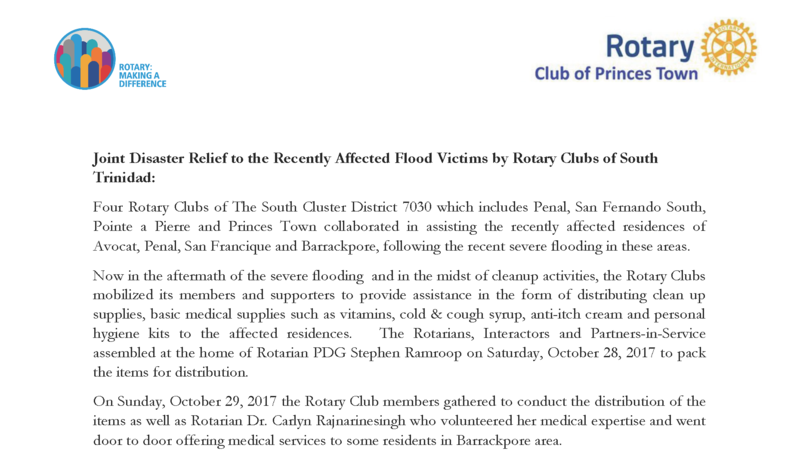 In the aftermath of tropical Storm Bret which caused flooding in several parts of Trinidad, the club rallied its members to assist the affected citizens in Caparo. 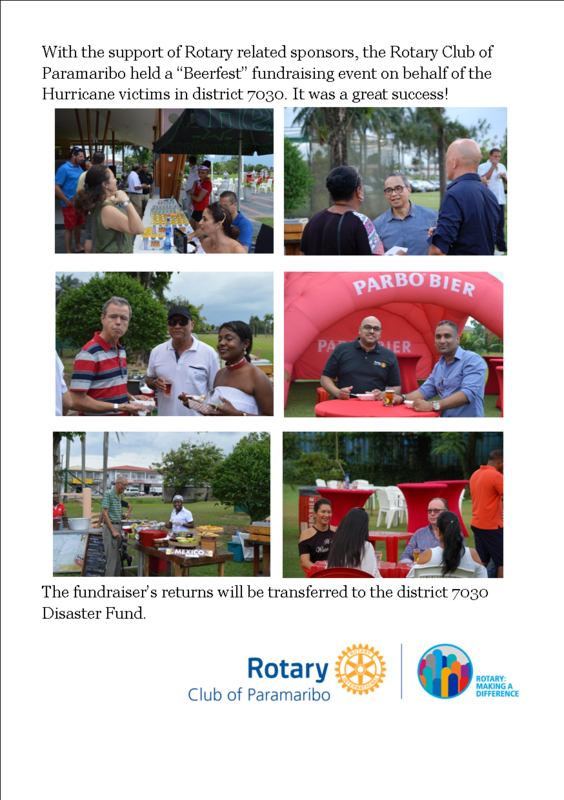 The club then partnered with insurer Sagicor and the Rotary Club of Piarco to provide similar relief to the Piarco/St Helena community, and assisted similar efforts in south. 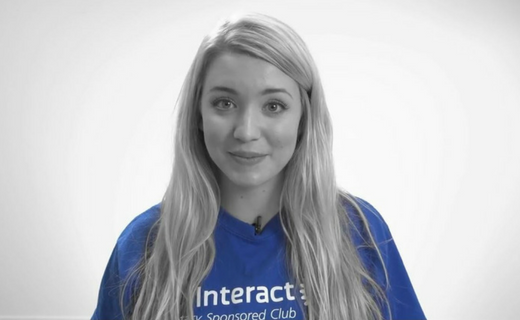 In addressing the club’s future, Williams noted new members were being recruited through the Interact and Rotaract systems. Since 2003, the club has been sponsoring and supporting the Rotaract Club of St Augustine which caters for people ages 18- 30. In 2014, the club began supporting the Interact Club of St Augustine Girls’ High School which recruits member’s ages 12-18. 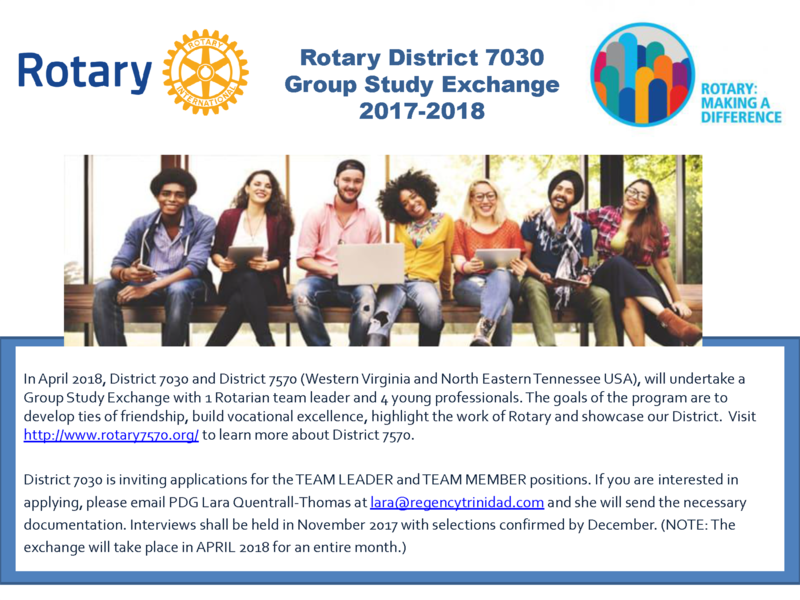 Rotary International is requesting the names and contact information of the incoming club officers entered into their database. Wednesday, December 13th 2017 at 10:00 pm at the CinemaONE Lobby & Theatres (IMAX & GEMSTONE), located at One Woodbrook Place, Port of Spain. With incredible food, drinks, games, giveaways and atmosphere included, this exclusive engagement promises to be one that provides a most memorable experience filled with both wonder and whimsy for all fans of Star Wars - both old and new! 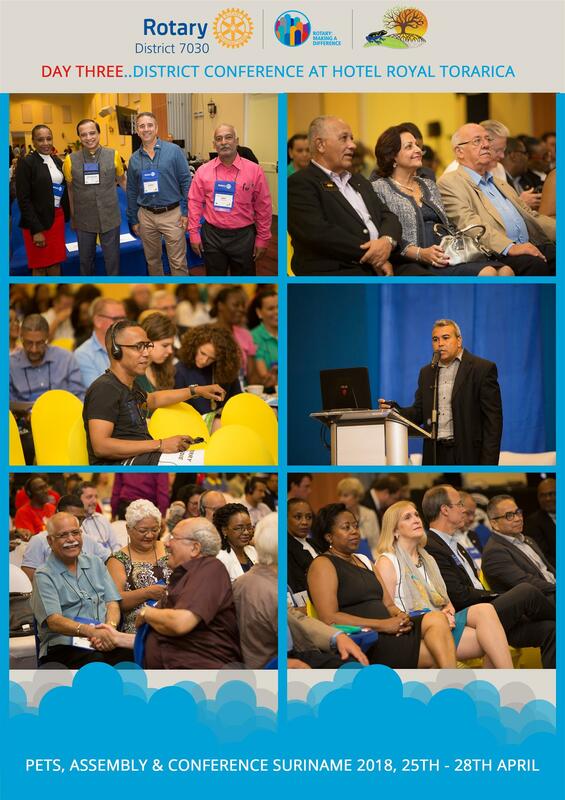 Not to mention that everyone in attendance will be the first in the Caribbean to see the film! 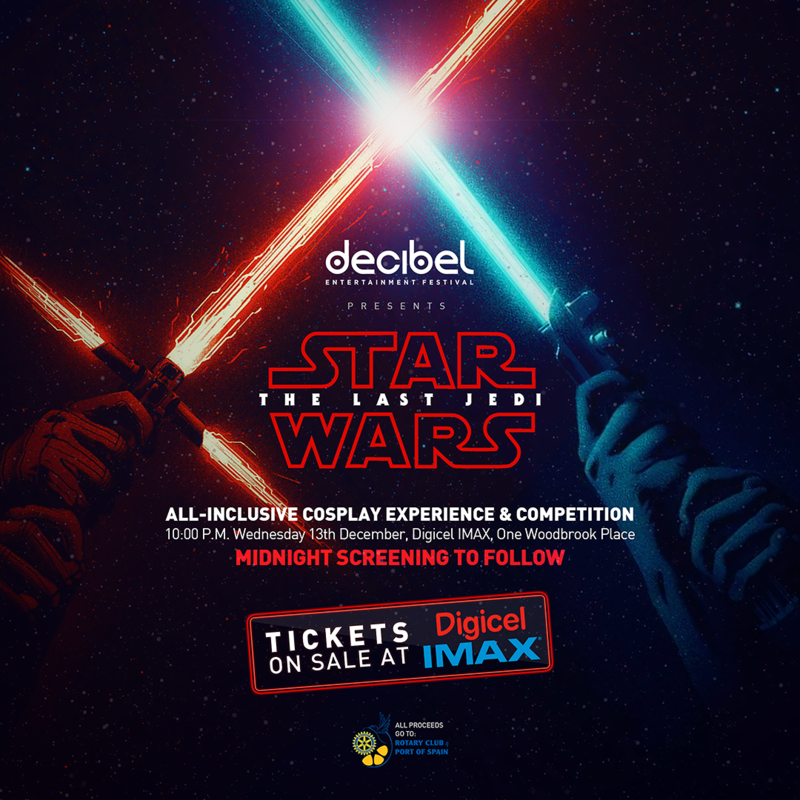 To add some more thrills to the evening, the event will also include a CosPlay competition with some of the best costumed characters from Star Wars vying for top honors. Everyone attending is also invited to come dressed in their Star Wars gear or as their favorite character. Tickets are $250 for IMAX Reserved Seating and $350 for GEMSTONE VIP Reserved Seating and are available via the CinemaONE Box Office or online. Private theatres for group purchases are available upon request. Please bear in mind to book your tickets early as there is limited seating and already significant demand. 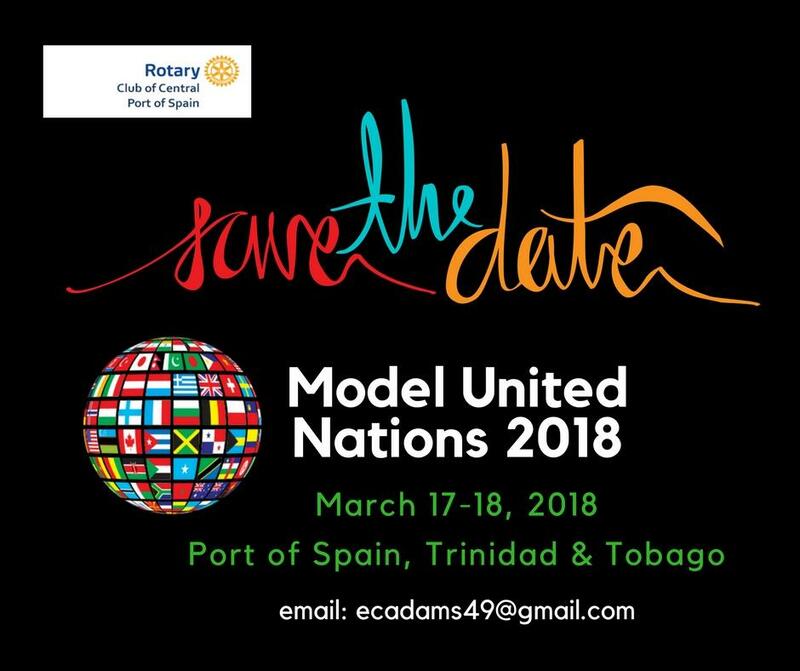 All proceeds raised by this event will go towards the continued support of the Rotary Foundation and of the Club's various humanitarian and community service projects in Trinidad & Toabgo which are aimed at assisting the differently-abled and disadvantaged in our community and include: the International Institute for Healthcare & Human Development and its Wheelchair Bus Service; the Peter Knaggs Children's Dental Clinic; and, the Princess Elizabeth Centre. For more information on the event, please check it out on Facebook. 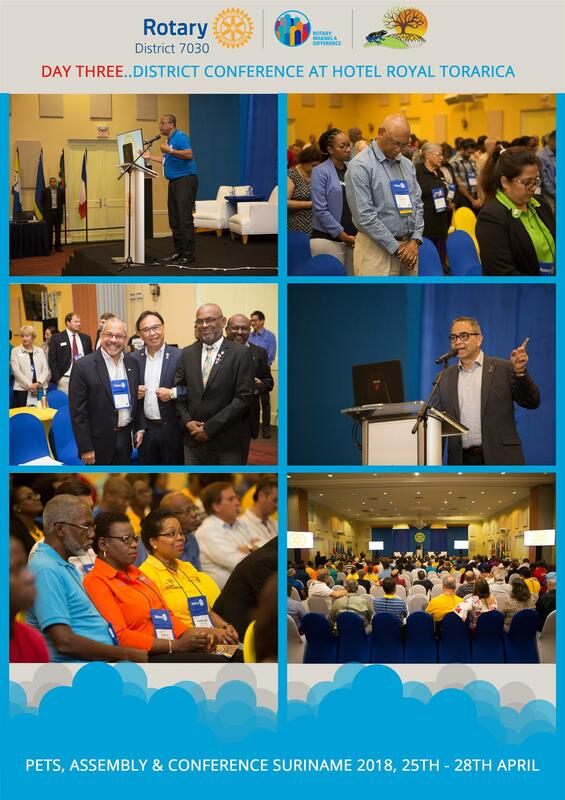 For group purchases or event inquiries please contact us via email: rotarypos@gmail.com or via phone: (868) 687-2339. Feel free to spread the word among your organization, friends, family and colleagues. Remember: It's not just a movie...it's an experience! 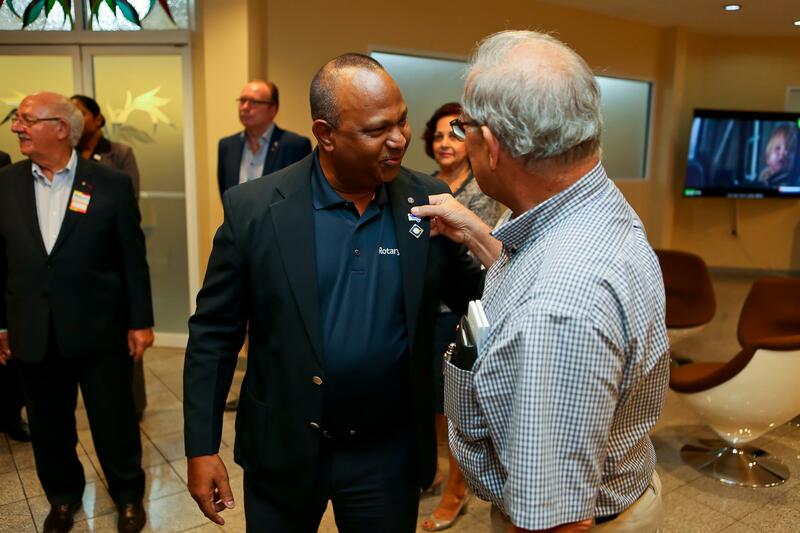 Interview with WaddySowma, RI District 7030 Governor, from Rotary Club of Panamaribo Residence, Suriname. What is the outcome of your stay in Martinique? 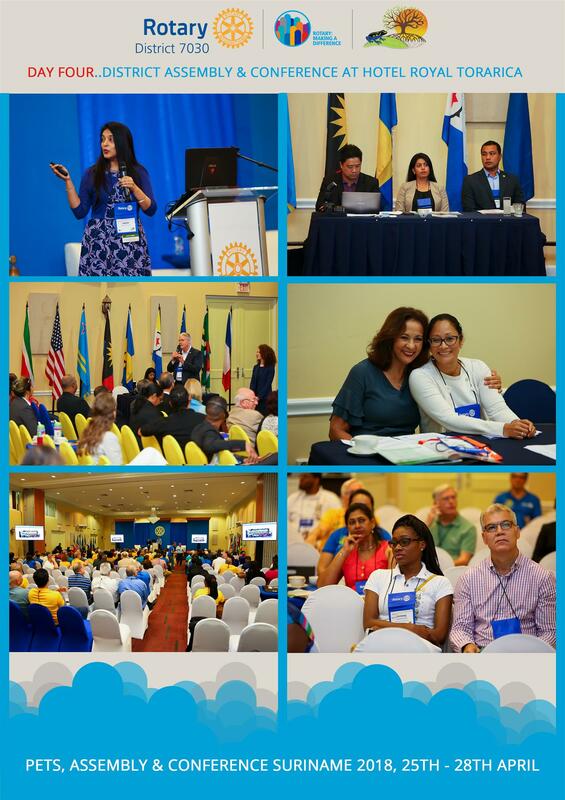 As Governor of district 7030, this includes the southern Caribbean from Antigua to Trinidad, French Guiana and Suriname, I had to visit the seven Rotary Clubs of Martinique, as well as the two Rotaract and Inner Wheel Clubs, with my efficient and remarkable assistant Thierry D' AbadiedeLurbe. 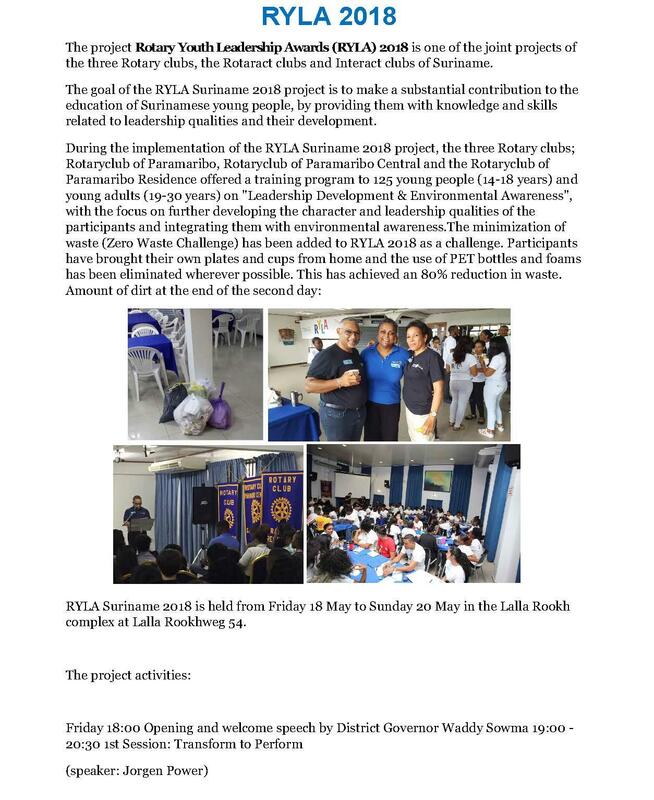 I have reviewed their goals and objectives for the year to see if they are in agreement with Rotary International and the district, and provide advice and recommendations. 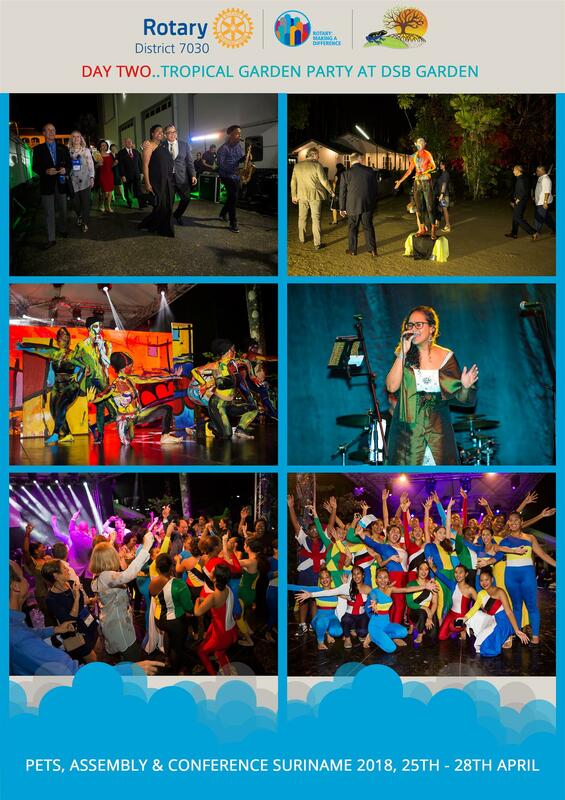 And of course, for me this year, the added value of my visit to Martinique is the celebration of the 60th anniversary of the Rotary Club of Fort de France (hereafter called Dean)! 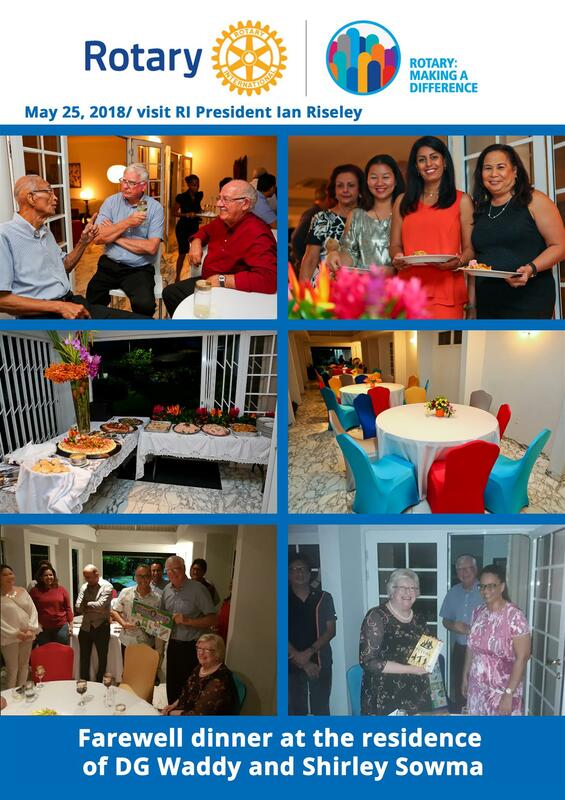 It was the first French-speaking club in the Caribbean created in August 1957 and received its charter from the Rotary Club of Paris (the oldest club in France) and its bell from the Rotary Club of Hollywood in Florida. 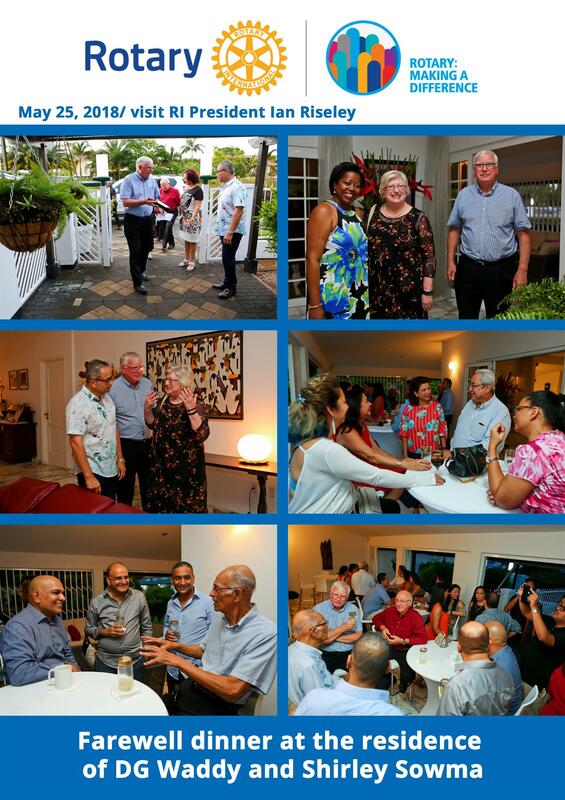 It was the island's only club for 13 years and then spread by sponsoring other Rotary Clubs and allowed the expansion of the Rotary family in Martinique, with theClub of Saint Pierre in 1970, then that of Fort de France Sud in 1975 etc.... It has been a driving force and continues to be very dynamic. 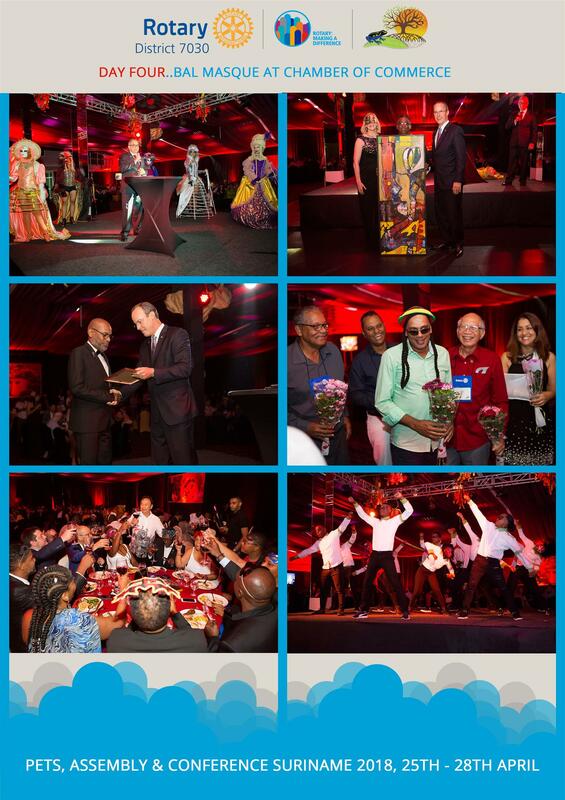 We owe them the 60 years of Rotary presence in Martinique, which was the theme of last Saturday's gala evening in my honour. Each club has its own DNA, its own specificities. 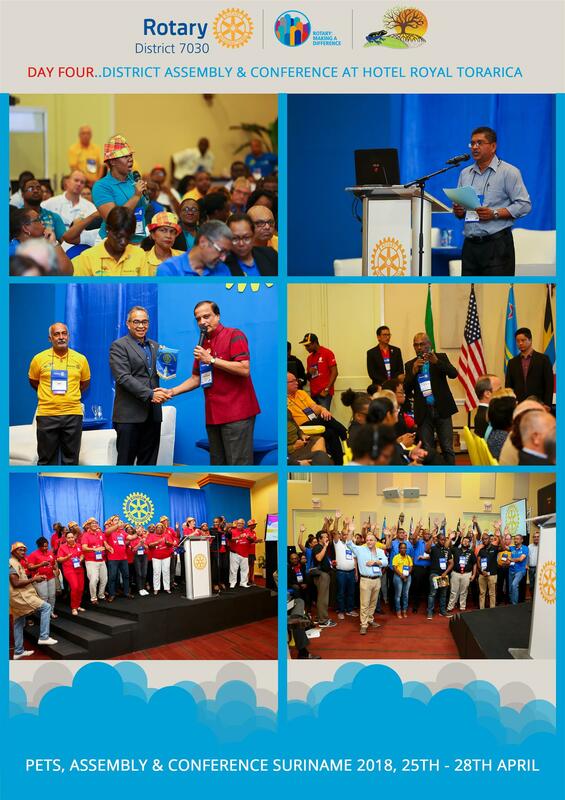 I've seen some very good service, and I've met many enthusiastic Rotarians, Rotarians, Rotaractors, and Rotaractors. 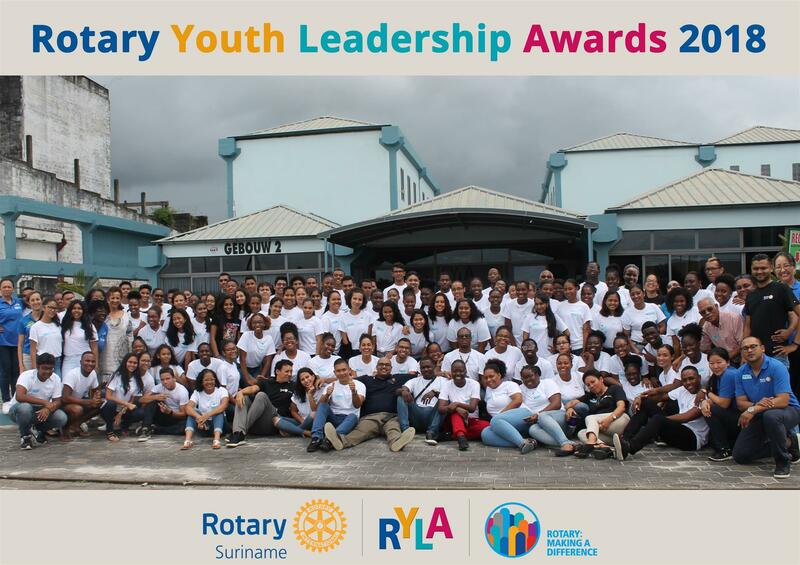 I encouraged them to take advantage of the training and education offered by the Rotary Leadership Institute (RLI) so that they could perform even better and play a role in Martinique society and contribute funds to The Rotary Foundation, giving them more flexibility for their projects. 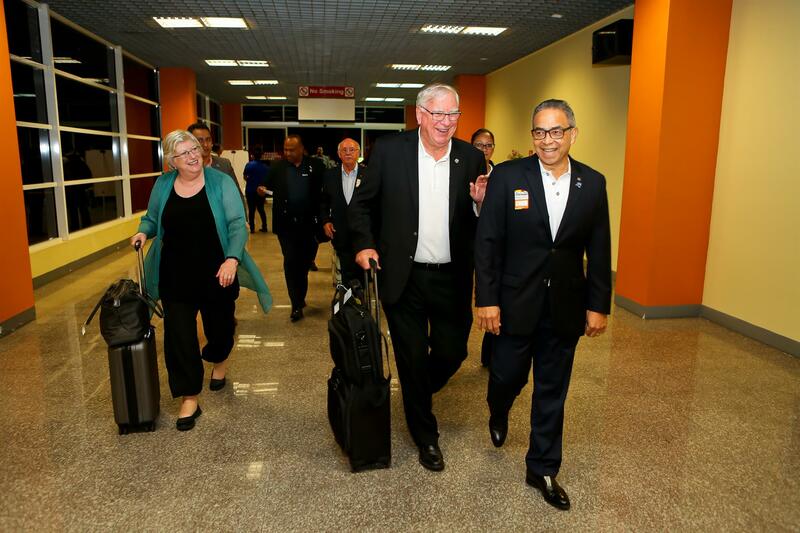 With HervéHonoré, who is in charge of The Rotary Foundation in our district, I spent the entire day on Saturday in Dominica with our Rotarian friends there and met with Prime Minister Skerrit to discuss medium- and long-term reconstruction projects with him. There is a lot to do and the situation is disastrous. We will play our full part in the reconstruction efforts. 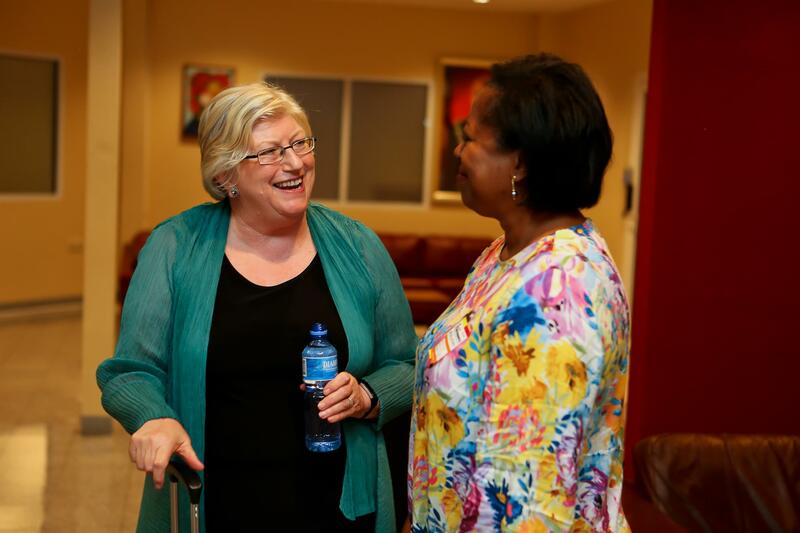 First of all, we must identify the projects that we will be able to support effectively. 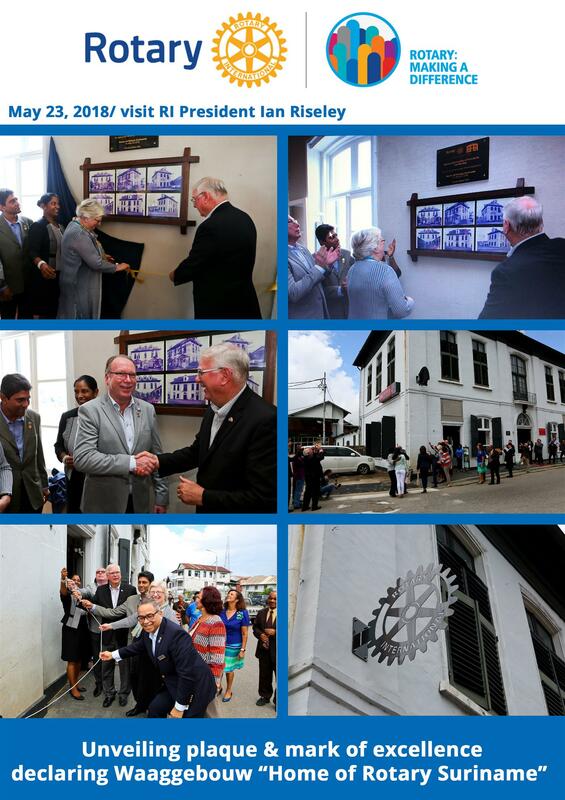 What can you tell us about the Rotary Club of Fort de France (dean) after your second visit to this club in 8 days? It's an underage club: 60 years old! Very proactive, I told them: you're not close to retirement! You're 20 years old! I had the pleasure of meeting them, I felt "positive and inspiring waves" during my first visit last Monday at lunch and that's why I decided to go back there a second time before leaving. I wanted to show them my friendship. 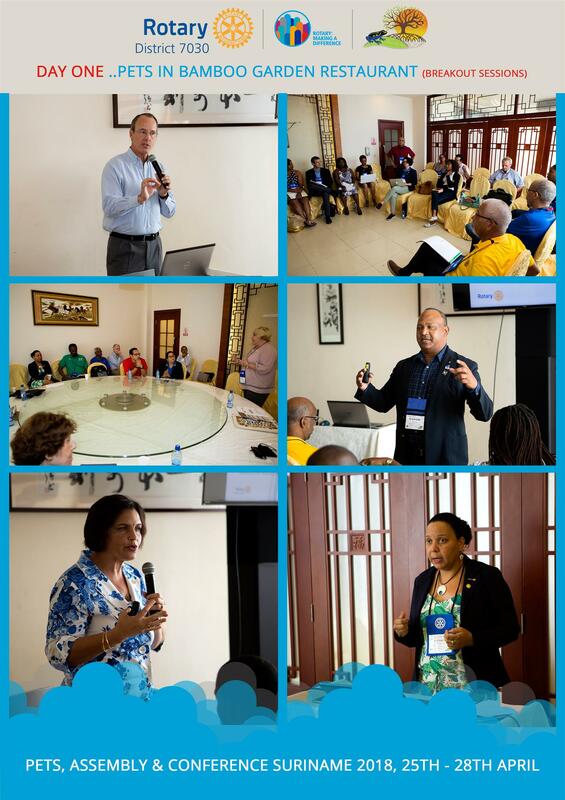 A 45-minute film about Rotary's 60th anniversary in Martinique, directed by one of their members Samuel Marie-Louise, was screened at a conference and debated in January. 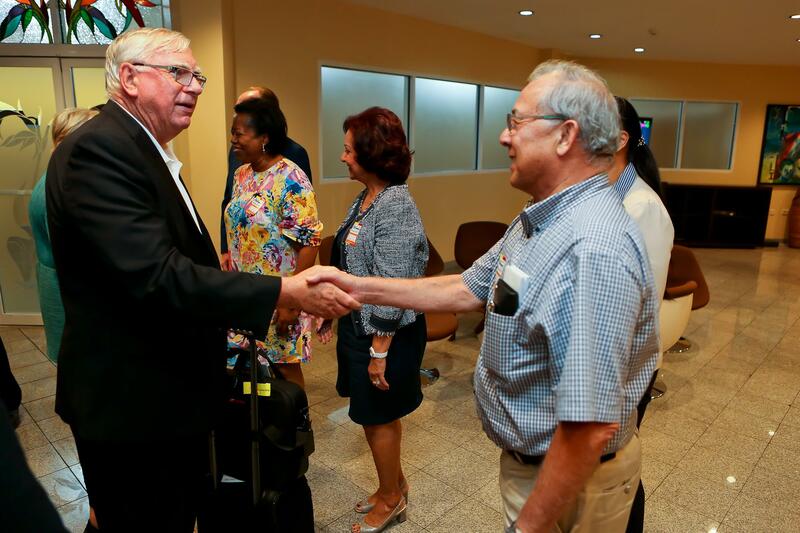 The film was given to the Rotary Club of Martinique to serve the Rotary community and beyond. Oh, that's wonderful. 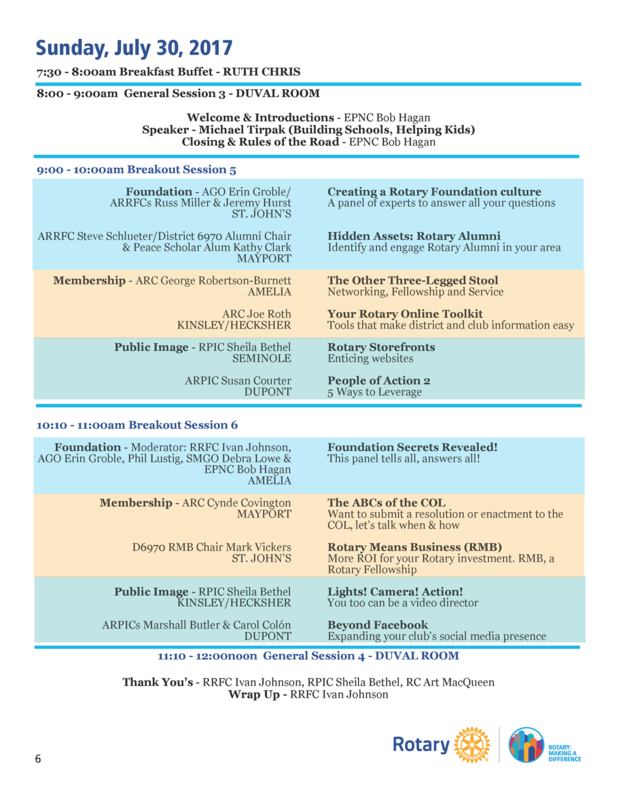 I think it's a great idea to work to promote Rotary. Fundraising for illiteracy with a VIP dictation to be given in the first quarter. 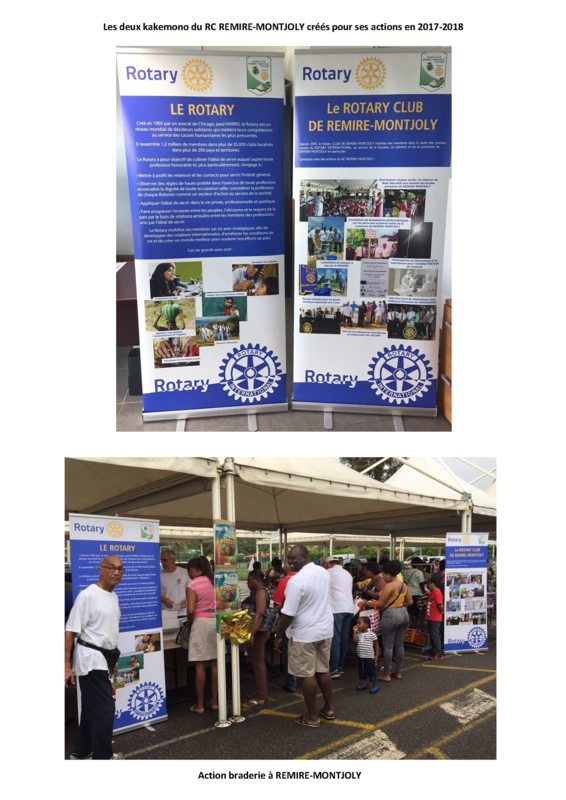 Once again, the club always plays a very positive role in promoting the public image of Rotary in Martinique. 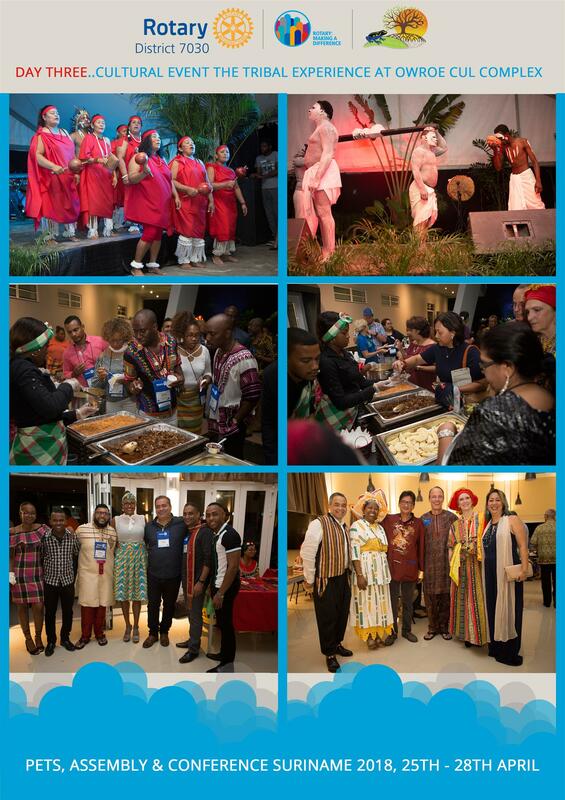 And then I also noted its openness to the international scene with a willingness to continue twinning with other Rotary Clubs in Europe, North Africa, United States etc. and that's very positive! I wished them to remain as enterprising as ever and gave them an appointment in 60 years. 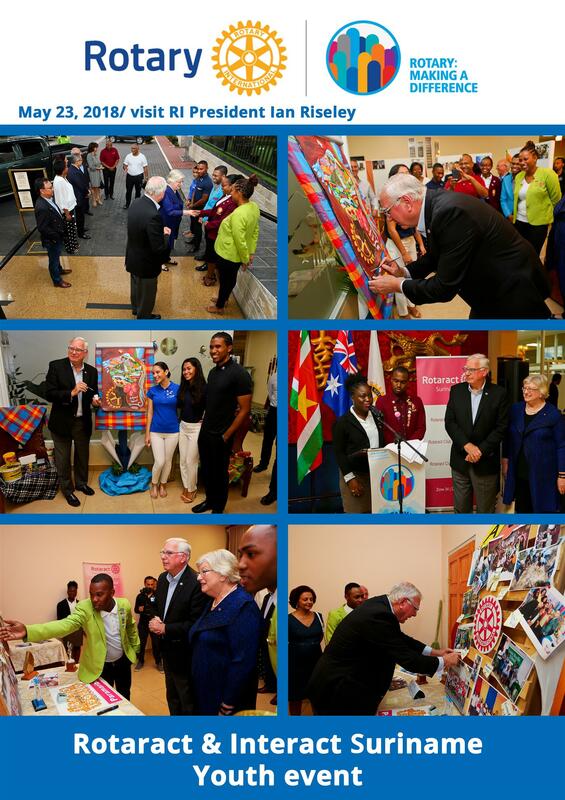 The Rotary Club of Grenada East is celebrating their 40th anniversary with weeklong celebratory events. 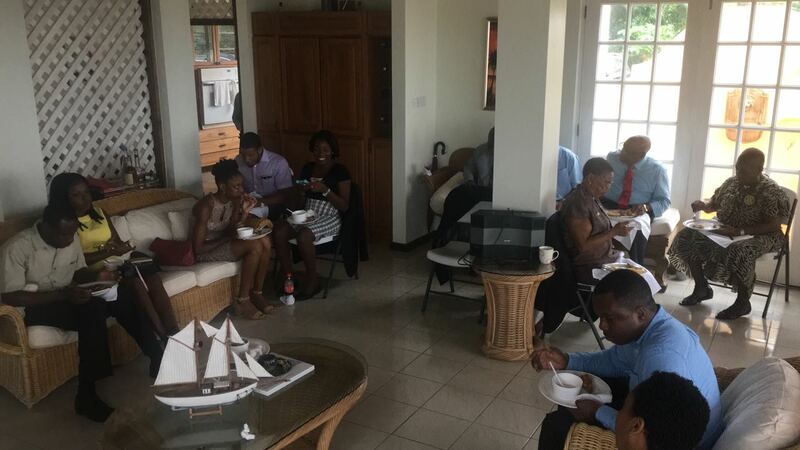 Starting with a church service and communal breakfast with Rotarians as well as friends of Rotary at our Rotary House (Leslie’s home). “Driiiing! Driiing!” My alarm rang out on a Saturday morning. My mind and body knew it was the weekend, and ganged up on me so that I had to crawl sluggishly out of bed. But the reason for my early wake-up soon dawned on me. It was the day of Lolo’s follow-up doctor’s appointment. Back then, during one of the long discussions I had with my husband-to-be about the societal ills which continue to pervade our country, we came to one conclusion: we needed to build our skills and knowledge further to make a difference on an even larger scale. Though I am from a small island of 1.3 million, thanks to a Rotary global grant, I am now studying in California for a doctorate in Educational Leadership, gorging on new knowledge and making the best of the international exposure. I am delving more into educational reforms and the principles of leadership, and I am eager to return to my country to bring about positive changes in education. 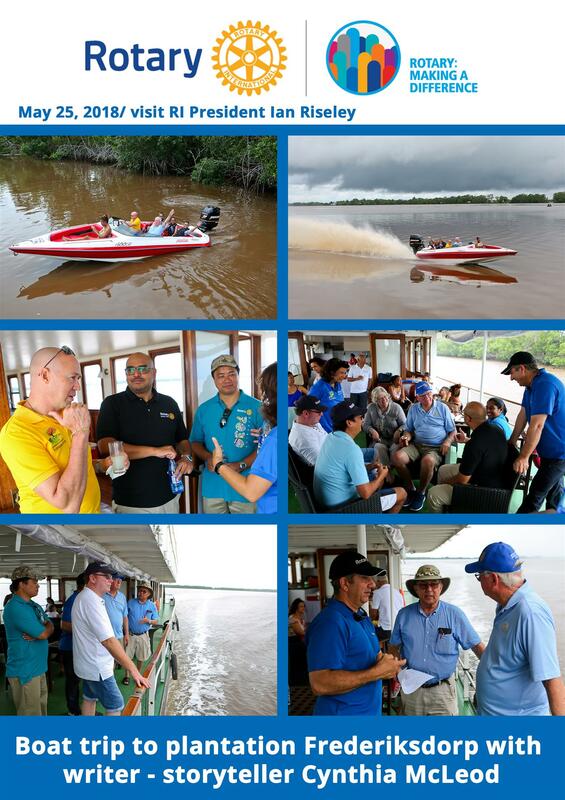 Since the launch of Rotary Global Rewards on 1 July 2015, over 100,000 members have visited the site! 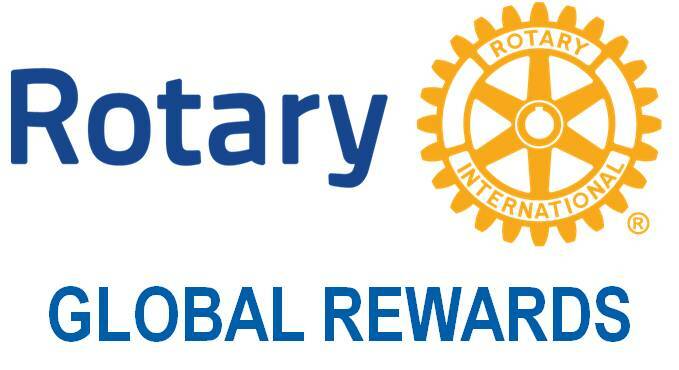 Rotary Global Rewards would like to thank you for supporting the program by spreading awareness of it among your district and clubs. If you have not visited Rotary Global Rewards recently, there are now over 1,500 offers worldwide. 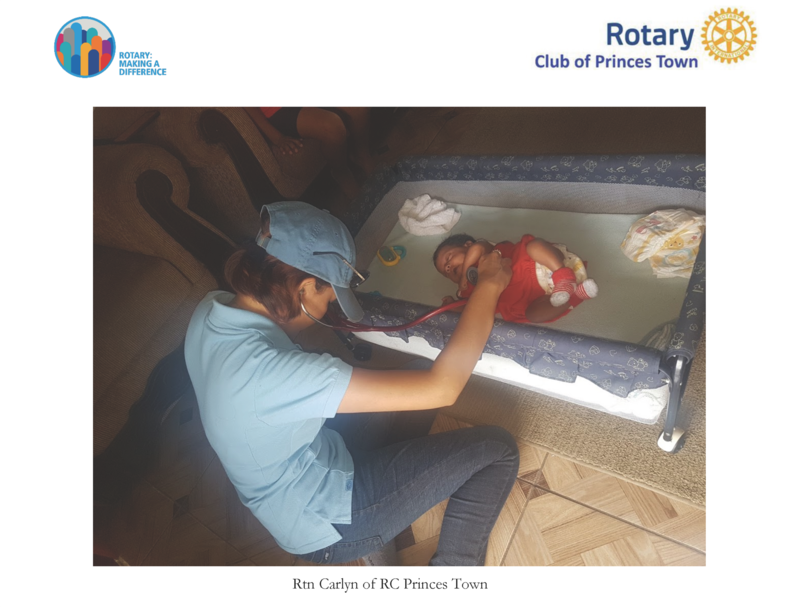 The 2017 Rotary Has Heart program is a Community Service Program which is a continuation from last year’s program, originally initiated by PRID Anne L. Matthews and expanded by PRID Robert Hall and now continued by RID Joe Mulkerrin. 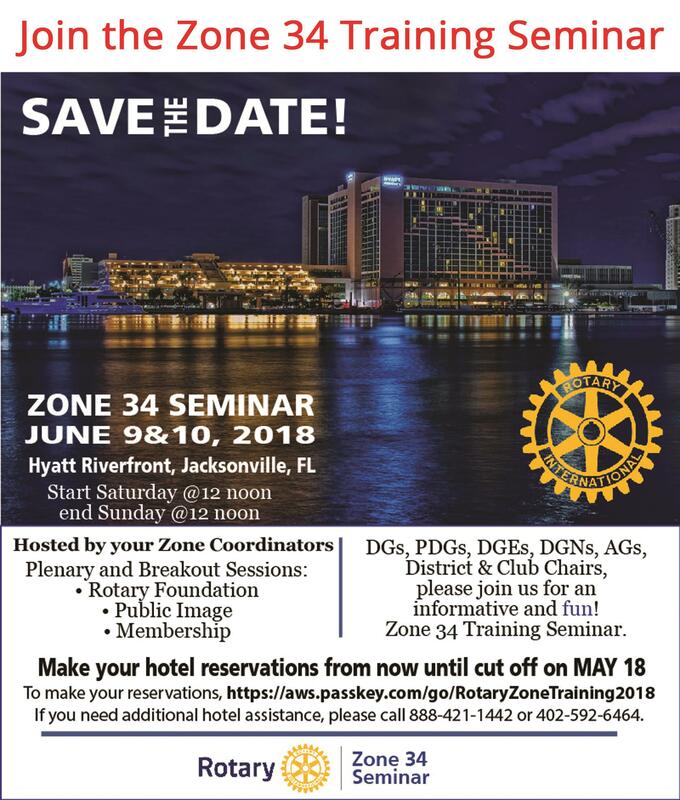 Zones 33-34 want all of its approximately 1600 clubs in the 29 districts to do a community service project in the 1st quarter of 2016 and let the community be aware of what Rotary is doing. 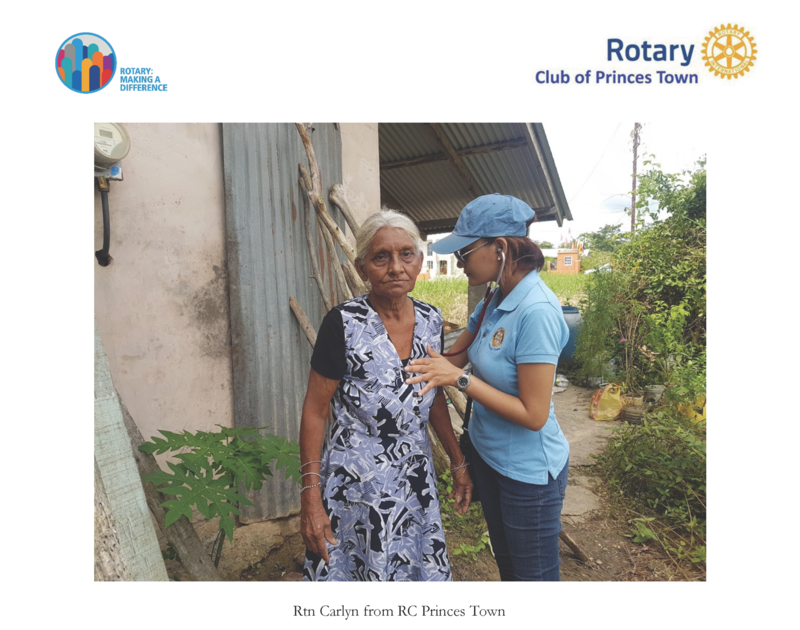 In so doing, we as Rotarians, can help those in need and improve Rotary’s image in each of our communities at the same time. 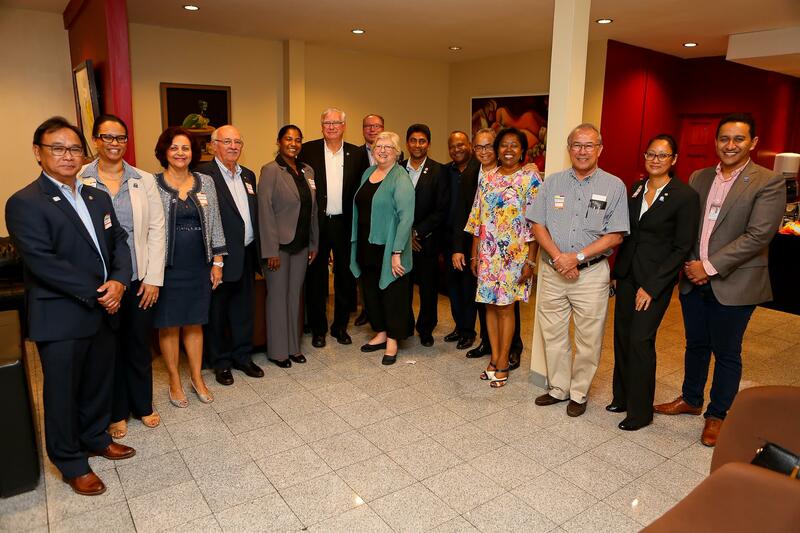 The Rotary Foundation Trustees and RI Board consider this awareness a critical element in our membership strategy which is key to Rotary’s future. This is especially important in Zones 33-34. 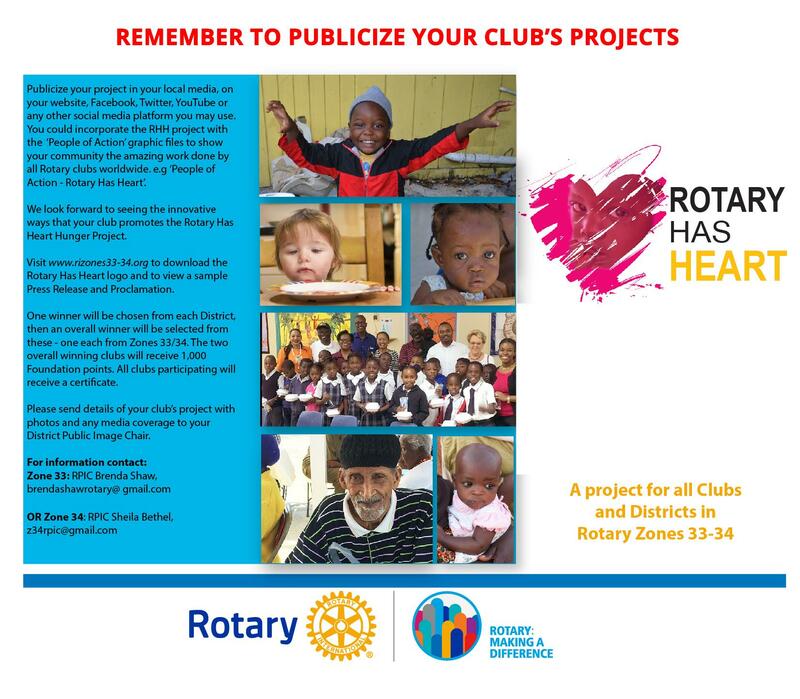 Therefore, publicity is a key requirement for Rotary Has Heart. 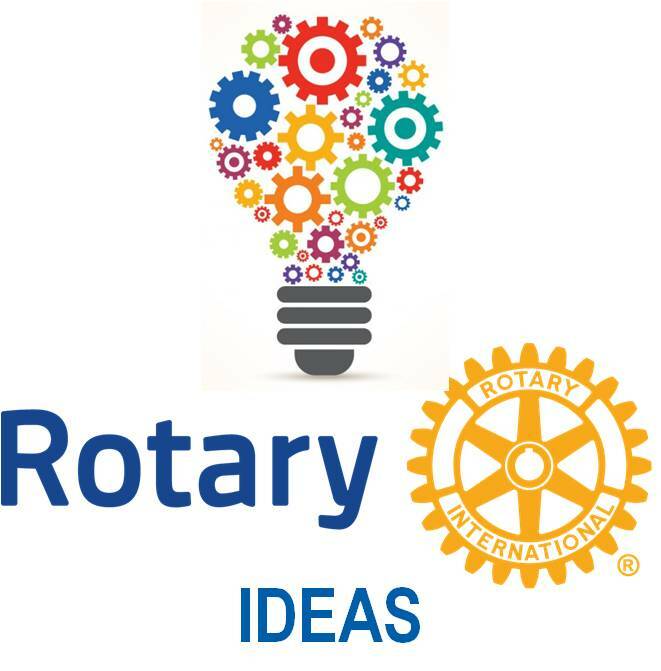 Rotary Ideas - Are You Connected? 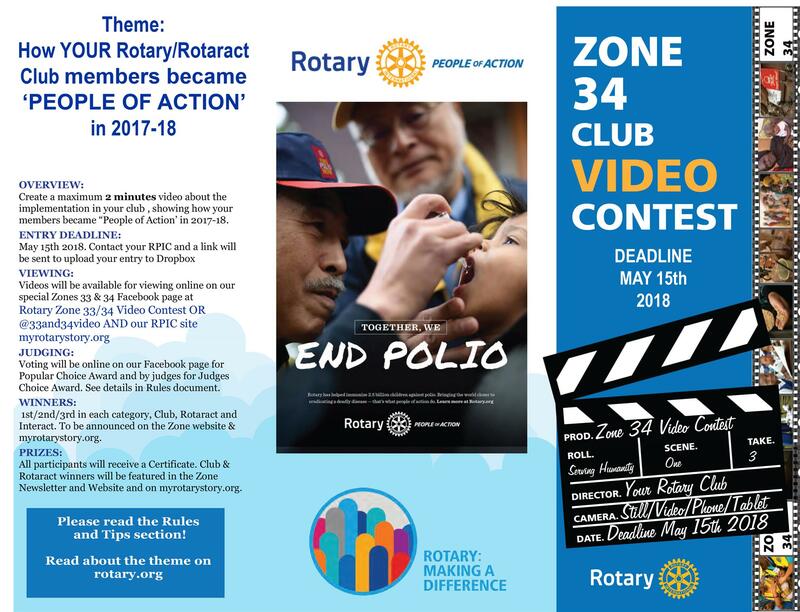 Clubs in Zones 33/34 are invited to create a video about the implementation in your club of the 2016-17 theme: "Rotary Serving Humanity". Several prizes will be awarded in both Rotarians Choice and Judges Choice categories. All winning videos will be featured on Zone websites, Facebook pages and YouTube channels. 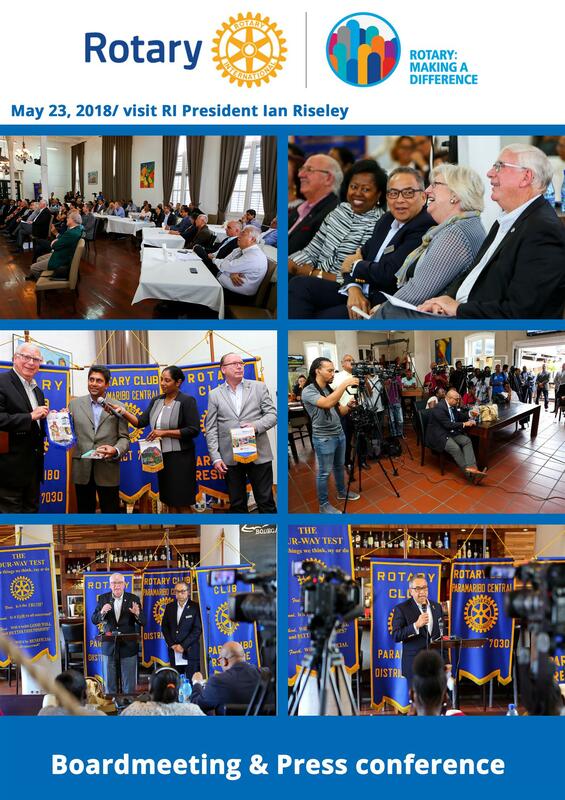 How we as Rotary Clubs share our story with the world is vital to our future. 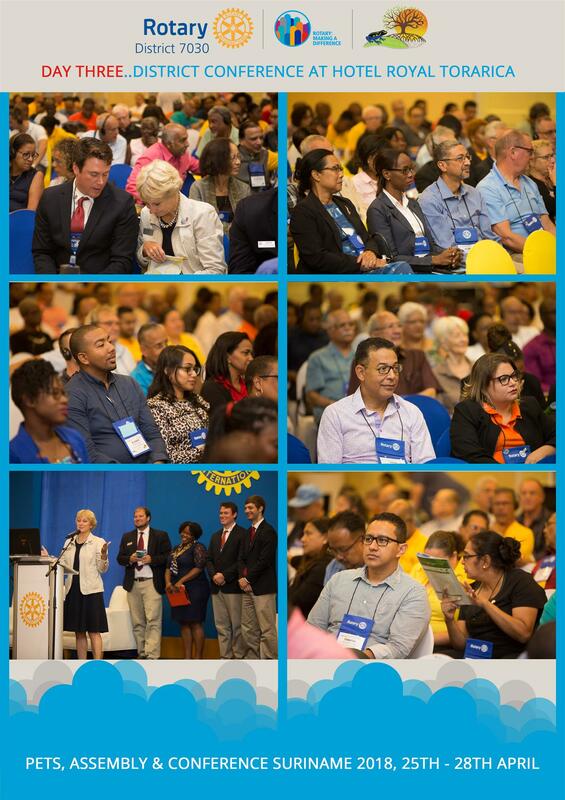 through a unified Rotary look and clear and compelling voice, we are enhancing our legacy as one of the most widely recognized and respected organizations in the world. 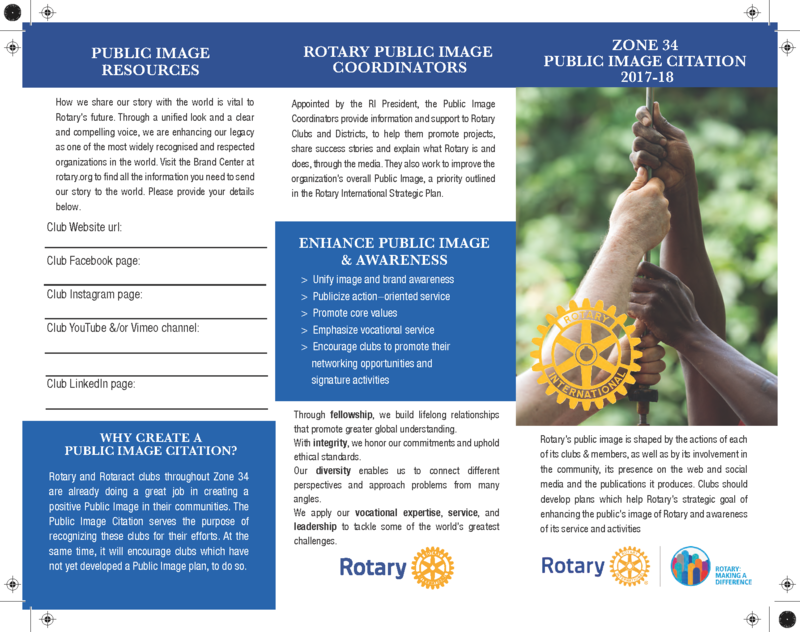 Every Rotary year, clubs who have distinguished themselves by meeting the high standards in Public Image and Relations are recognized and awarded by Rotary Zone 33/34 with the Zone Public Image Citation. 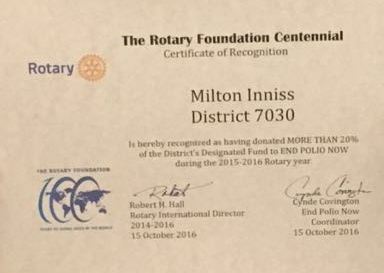 Last year (2015-2016), nine clubs in District 7030 received recognition and we think that we can do even better in 2016-2017. 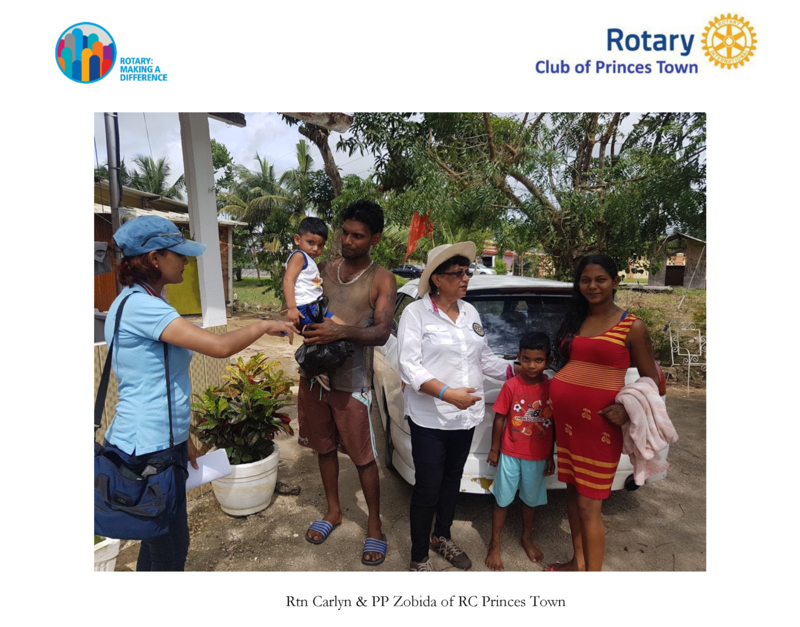 On August 13, 2016, members of the Rotary Club of Stabroek provided Geeta Boodhoo and her children with much needed supplies. 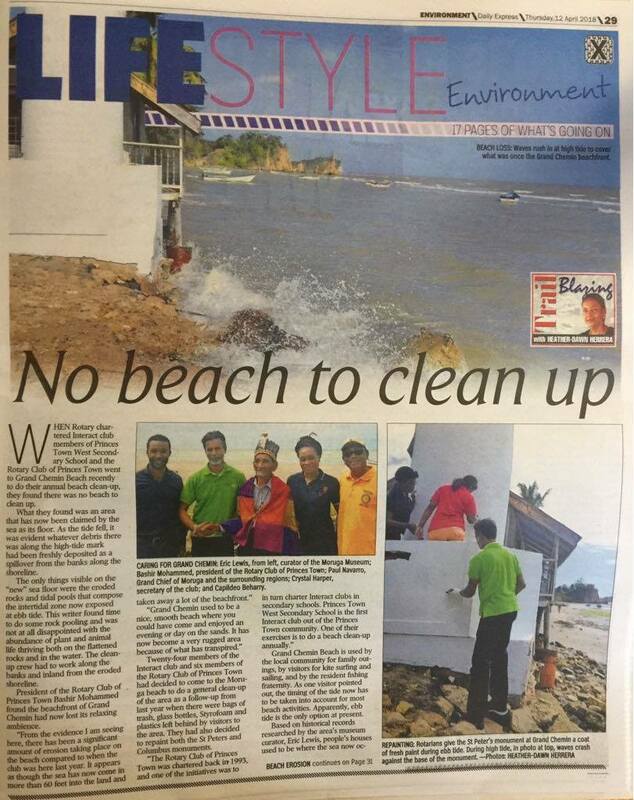 After reading Boodhoo’s story in the Sunday Stabroek, Immediate Past President of the Club, Luana Falconer, contacted Stabroek News to find out how to offer assistance to Boodhoo. 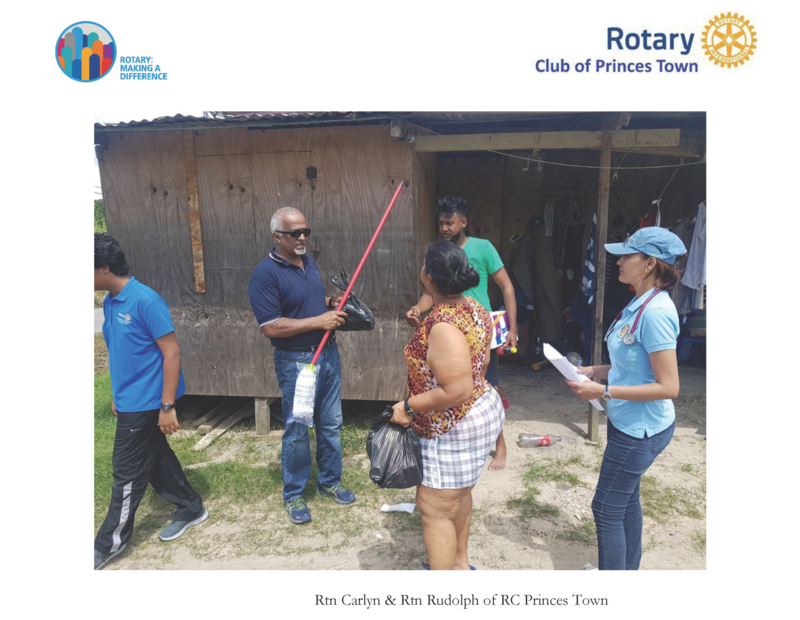 Falconer and Rotarian Marcia Marcus then visited Boodhoo to conduct a needs assessment. Humbled by the conditions under which Geeta and her children were living, the Rotarians sought to do more that fulfill the back-to-school needs of the children. 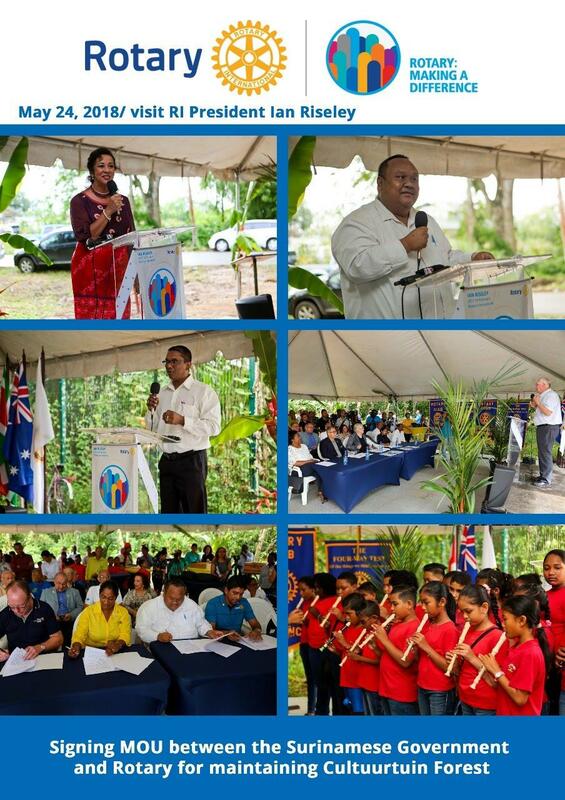 The Rotary Club of San Fernando, Trinidad, is off to a great start this Rotary year! With several service projects already under their belt, the club is leading the way forward in their community. In July, the Club distributed scholarships to six (6) students from Pointe-A-Pierre Government Primary School and Mon Repos RC Primary School who were successful in their secondary school entrance examinations. 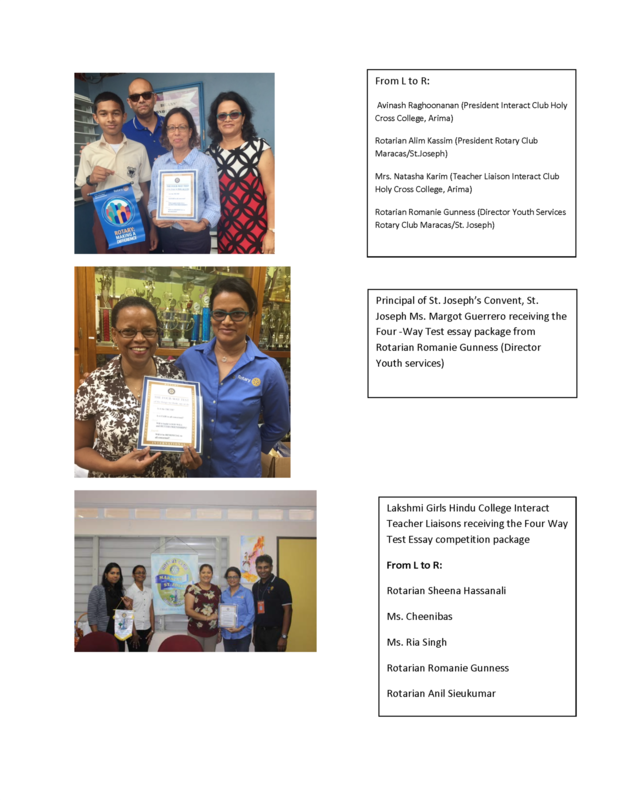 Worth TT $500 each, these scholarships were to assist these young persons in purchasing school supplies. 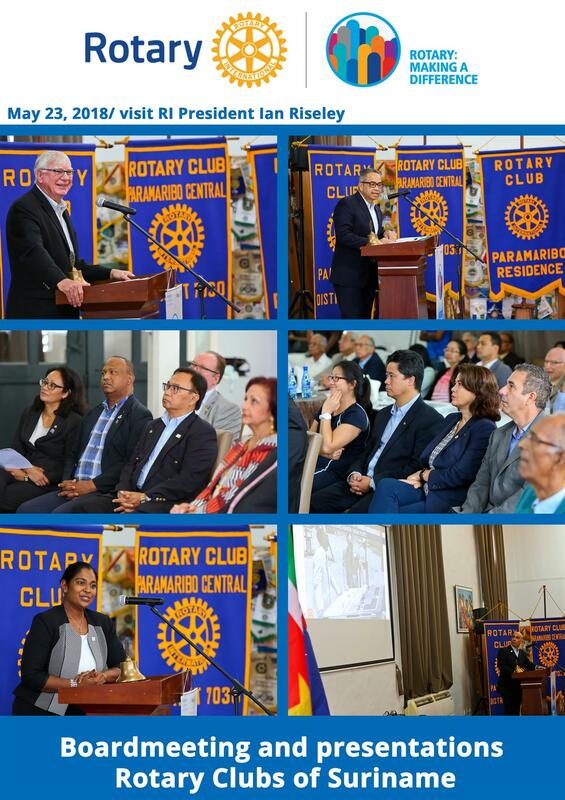 On September 3rd, 2016, Stabroek Rotary chartered the Rotaract Club of Stabroek which is an organization of young adults (between the age of 18 and 30) in the Rotary International structure. 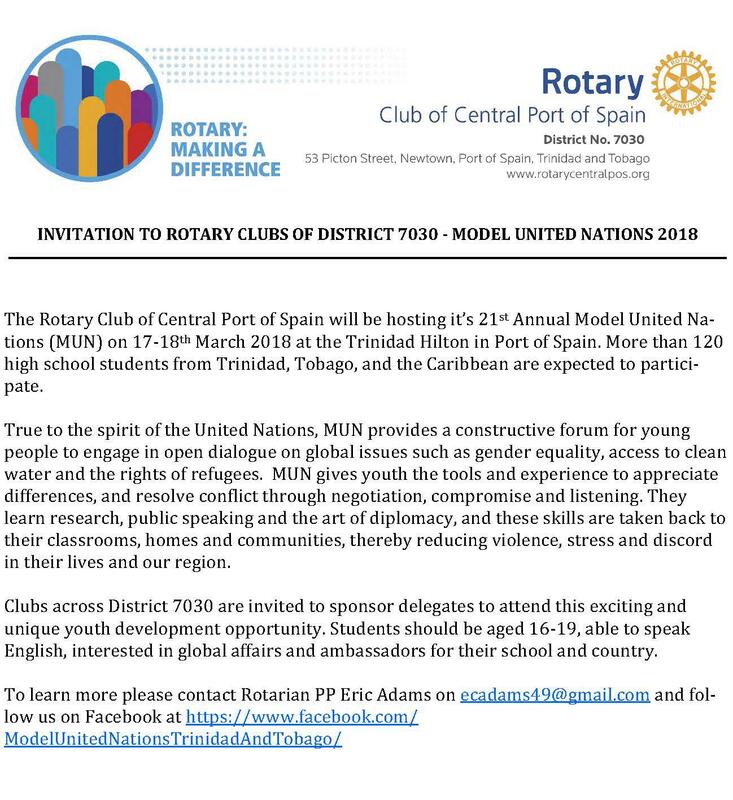 The club was formed based on increased demands from past and current interactors of Stabroek Rotary’s Interact Club of St. Joseph’s High School which targets students from age 12 -18. 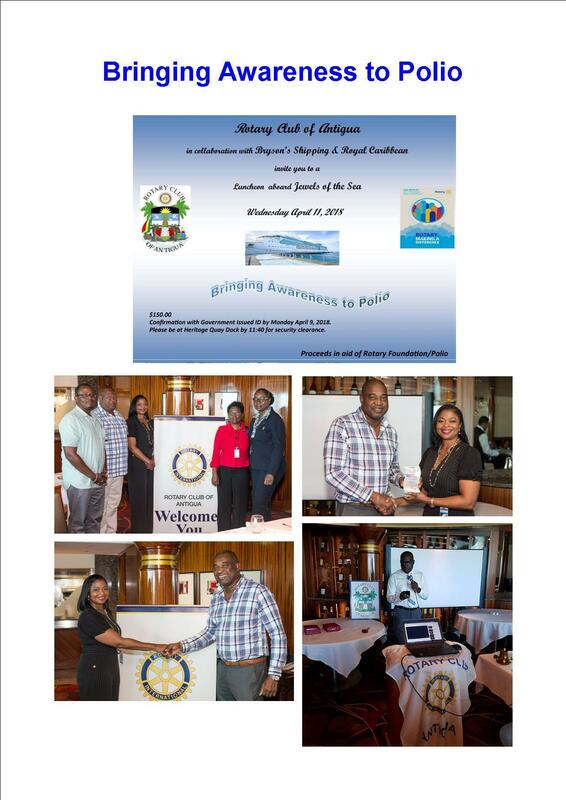 In a concerted effort to inspire “Service Above Self” amongst youths, the Rotary Club of Maracas/St. Joseph is leveraging the power of 3D printing. 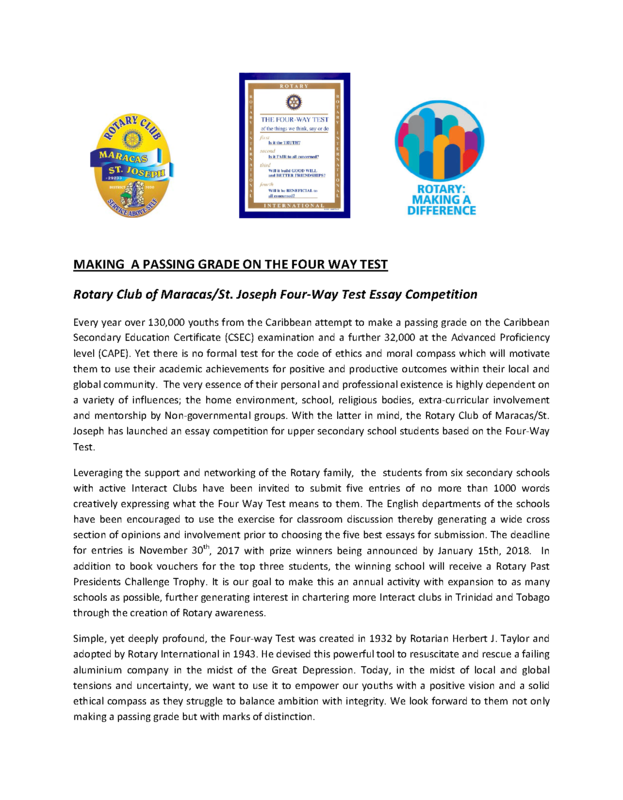 The pilot project, known as eNABLE INTERACT, will see the Rotary Youth Interact Clubs of Hillview College and St. Joseph’s Convent, St. Joseph collaborate with an international organization known as the enable Community Foundation (ECF). The latter is a global network of passionate volunteers using 3D printers to create prosthetic, mechanical hands for persons in need. 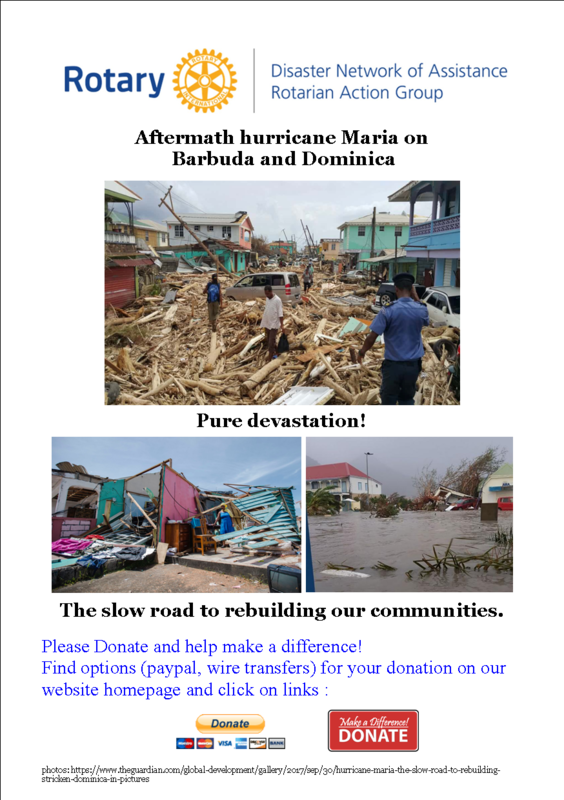 Even as parts of Haiti were still recovering from a catastrophic 2010 earthquake, Hurricane Matthew tore through the impoverished island country 4 October, leaving hundreds dead and many more homeless. A ShelterBox response team of volunteers from Canada, England, New Zealand, and the United States traveled to Port-au-Prince, Haiti's capital, last week to assess the damage and decide how best to help people. ShelterBox, an independent charity, is Rotary's project partner for disaster relief. RC Maracas/St. 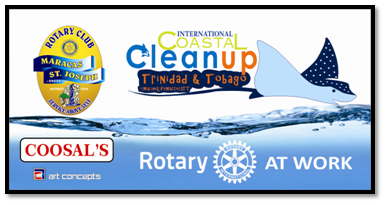 Joseph: "Please Take All Your Garbage With You"
On Saturday 17th September 2016, as part of International Coastal Clean Up Day, the Rotary Club of Maracas/St. Joseph joined with Coosal’s Construction Limited and other volunteers from The St. Joseph Interact Club (St. Joseph), Hillview College Interact Club, Members of the Llunego Village Council, Members of the Acono Village Council, the MVCC Environmental Team and the Maracas Valley Action Committee. 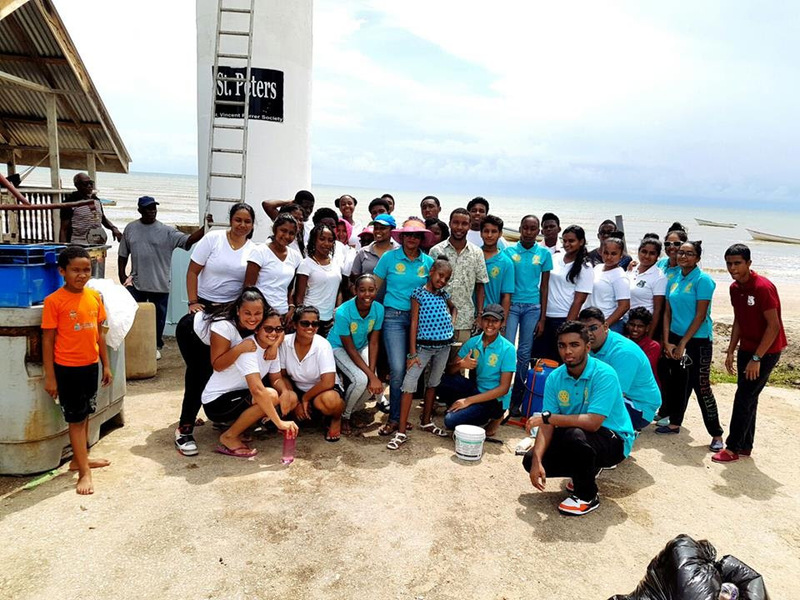 Charged with a total of 63 volunteers comprising 11 teams, the Rotary Club’s clean up exercise commenced as early as 8.30 am and finished at approximately 12.00 noon. 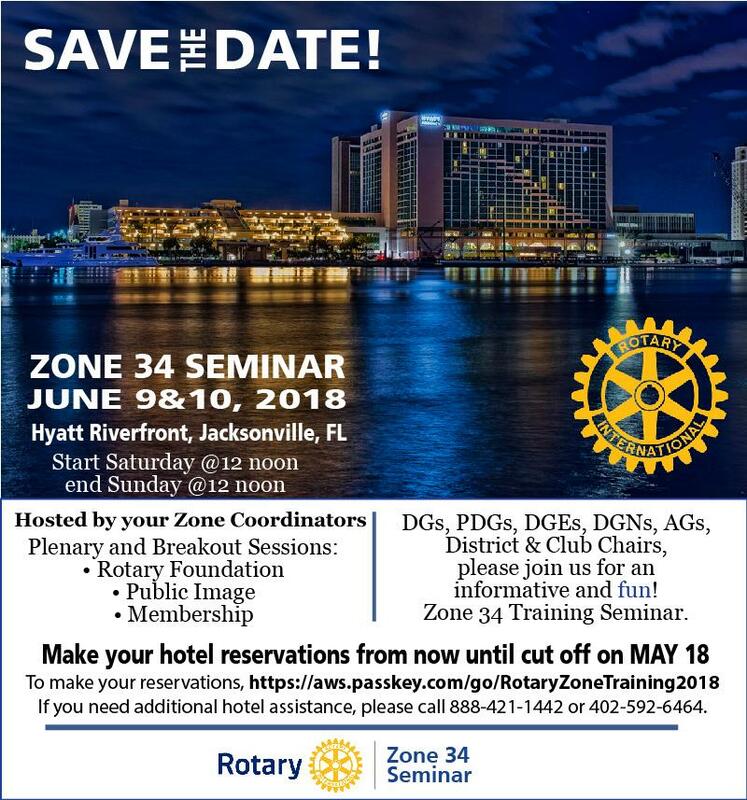 At the 2016 Zone 33/34 Institute which took place from 13th thru 16th October 2016 in Charlotte, North Carolina, District 7030 was recognized for having contributed more than twenty percent (20%) of its District Designated Fund to END POLIO NOW (the Rotary Foundation's PolioPlus Program) during the 2015-2016 Rotary year. 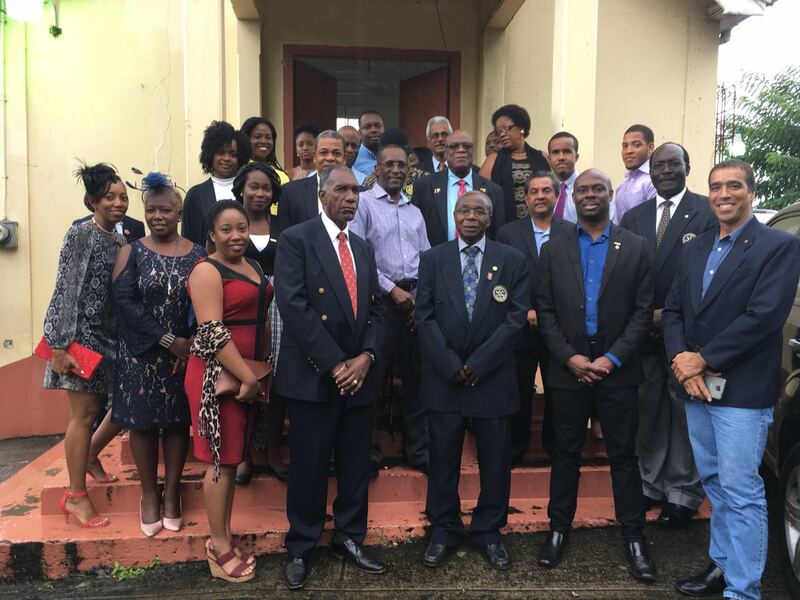 Immediate Past District Governor Milton Inniss received the certificate on behalf of the District with DG Roger Bose, DGE Waddy Sowma and many other Past District Governors attending the event and representing D7030 to the fullest. Does your club make effective use of social media? 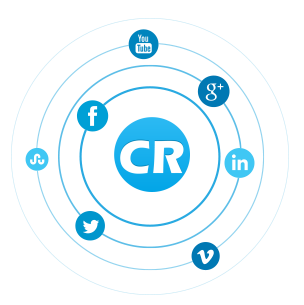 Social media has revolutionized the way we connect with our friends, family and acquaintances in our network. Through their pictures and online posts, we can tap into their likes and dislikes, which effectively can have an impact on you. It has become a portal of advocacy - a way to get the word out, and often, we even see viral trends. It isn't as simple as just having a presence however. 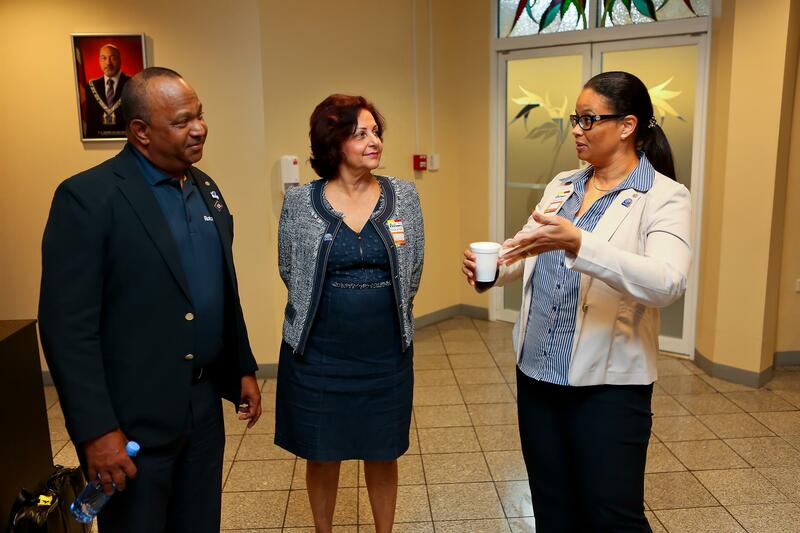 On Sunday 16th October 2016, the Rotary Club of San Fernando hosted its first Medical Outreach for the Rotary year at the Williamsville Community Center. 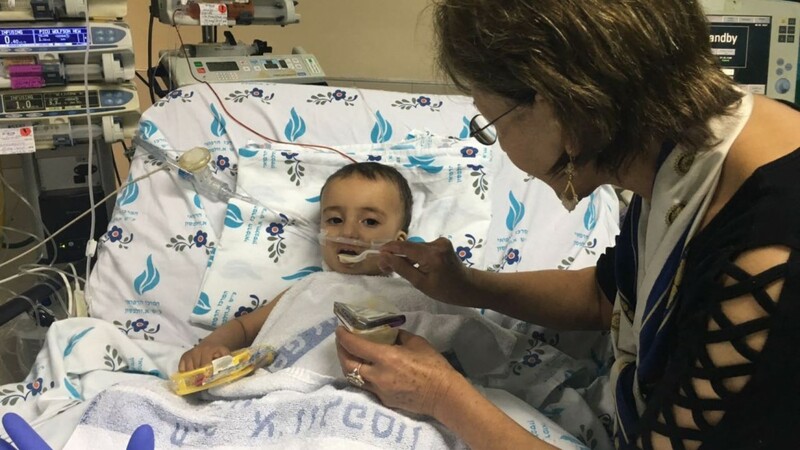 From 9:00 a.m. to 12:00 noon, doctors and nurses accommodated about 90 individuals from the area, running several common health tests and general checkups on all present. 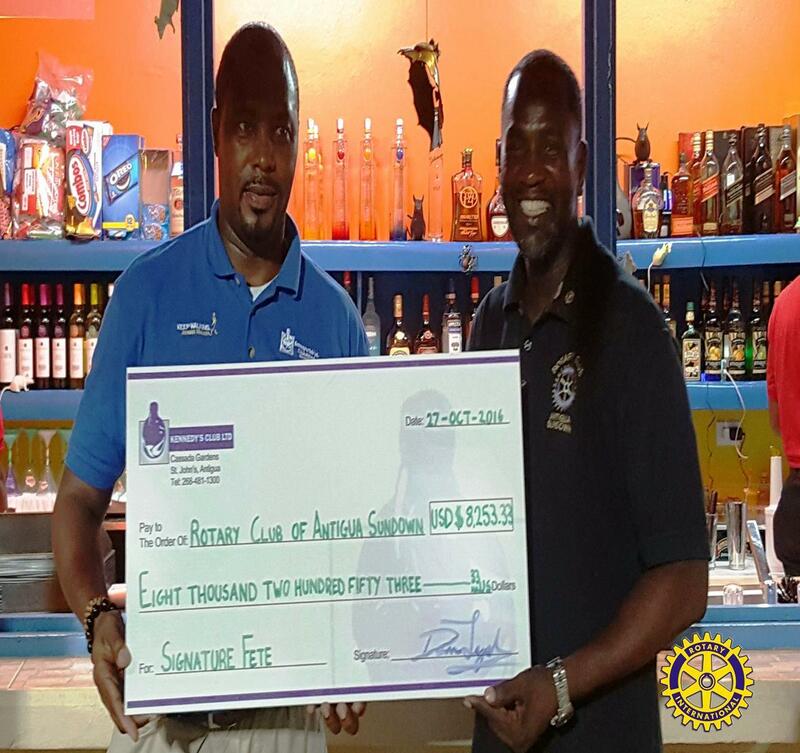 St. John’s Antigua, October 28, 2016 – Kennedy’s Club Ltd. (KCL) recently donated over Twenty-Thousand Eastern Caribbean Dollars (US $8253) towards the "Signature Fete" - one of Rotary Club of Antigua Sundown’s largest annual fundraisers. 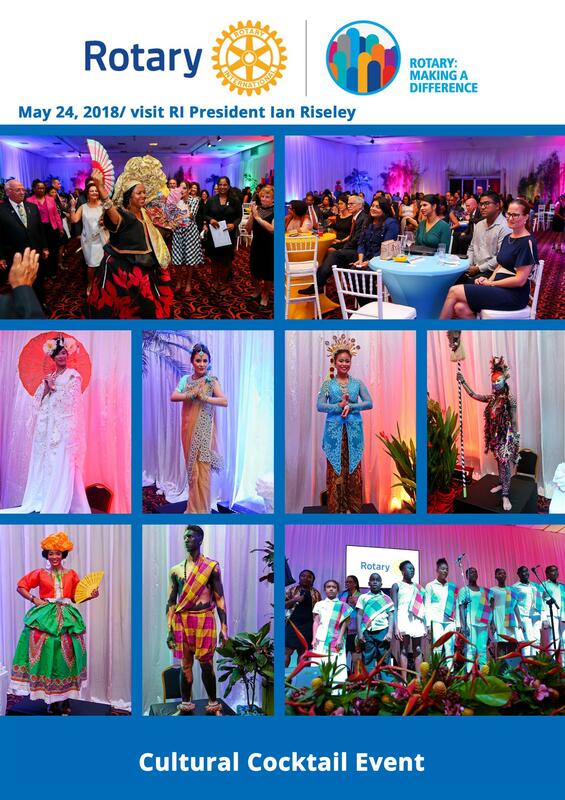 The fete which will be held at the Antigua Athletic Club will take place on December 10th, 2016. 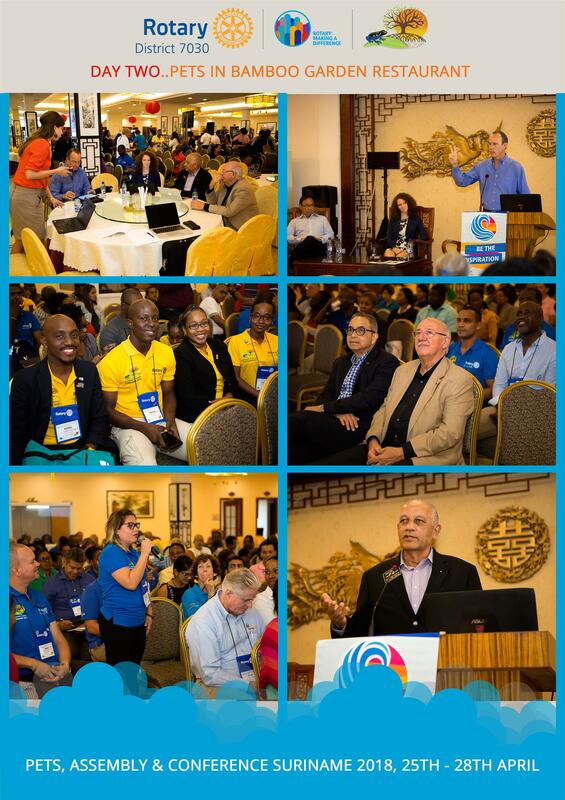 The 2016 Council on Legislation may well be remembered as one of the most progressive in Rotary history. 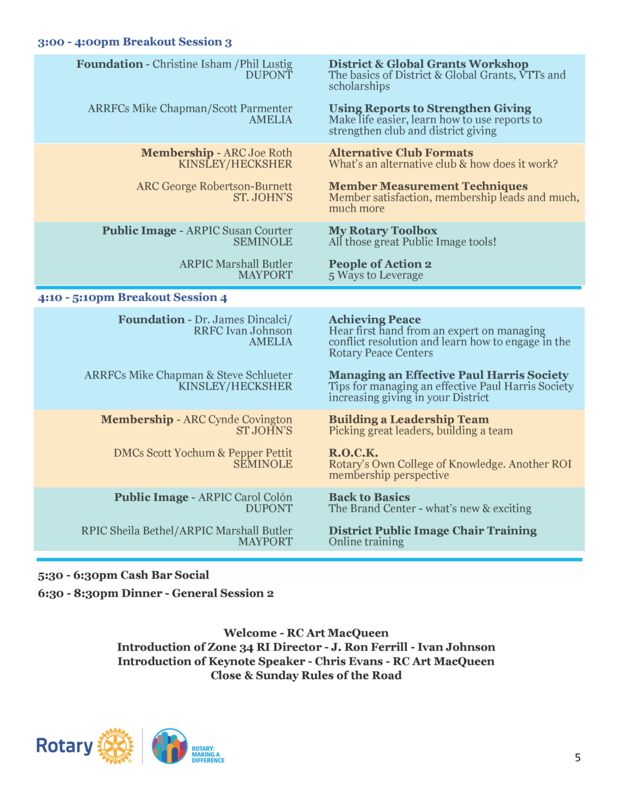 Not only did this Council grant clubs more freedom in determining their meeting schedule and membership, it also approved an increase in per capita dues of $4 a year for three years. 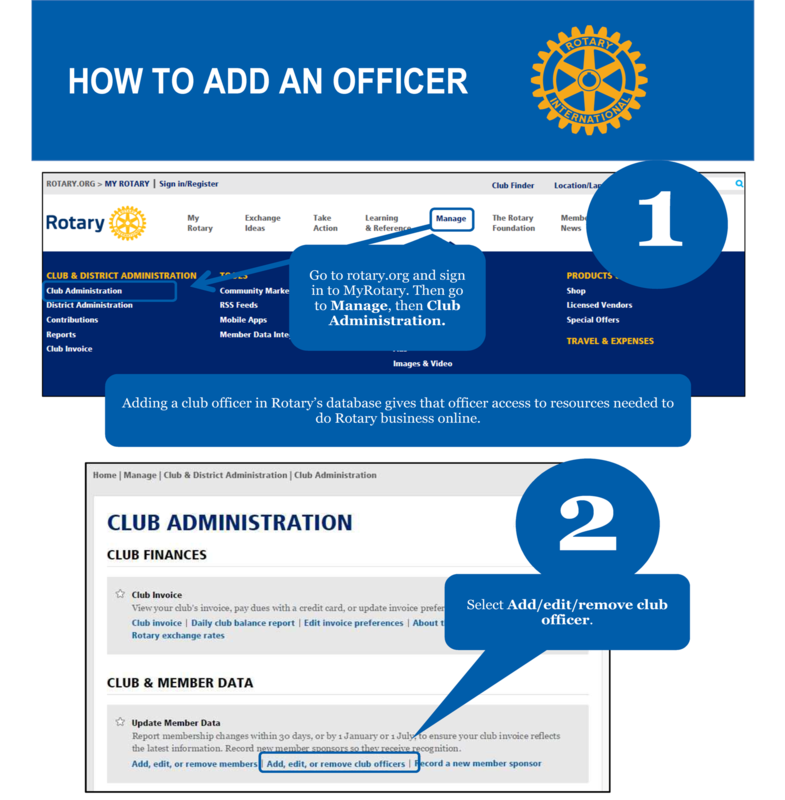 The increase will be used to enhance Rotary’s website, improve online tools, and add programs and services to help clubs increase membership. 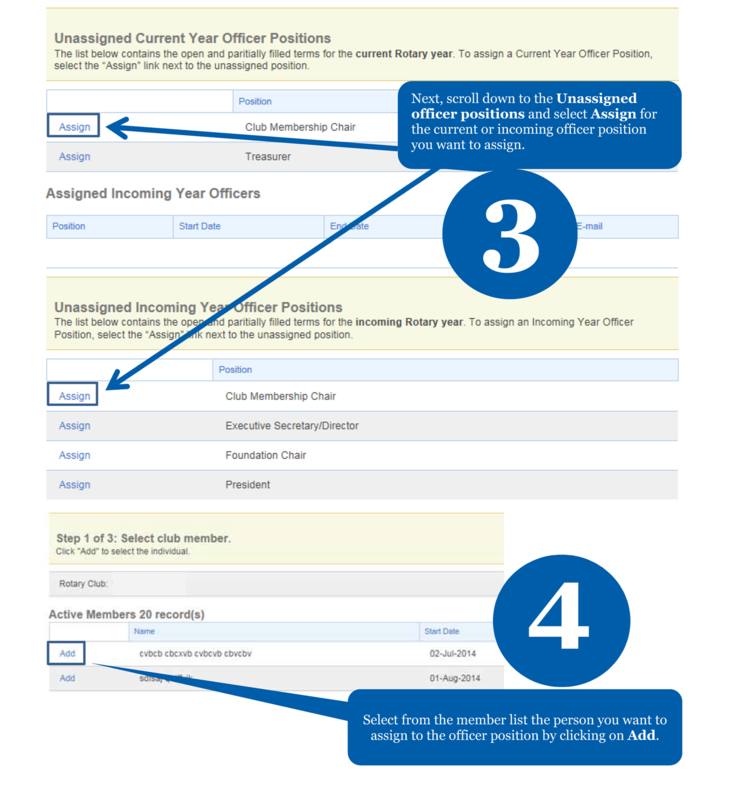 The RI Board put forth two proposals that increase flexibility. 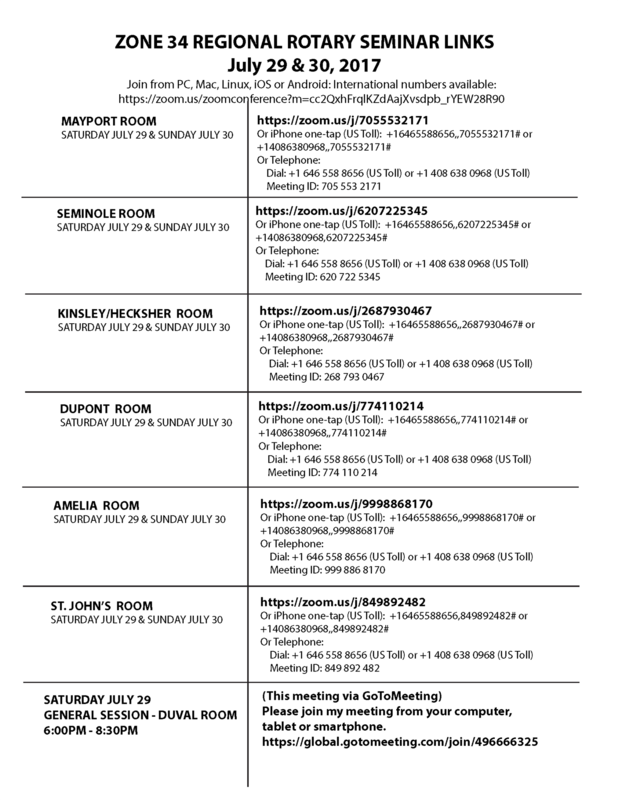 The first measure allows clubs to decide to vary their meeting times, whether to meet online or in person, and when to cancel a meeting, as long as they meet at least twice a month. 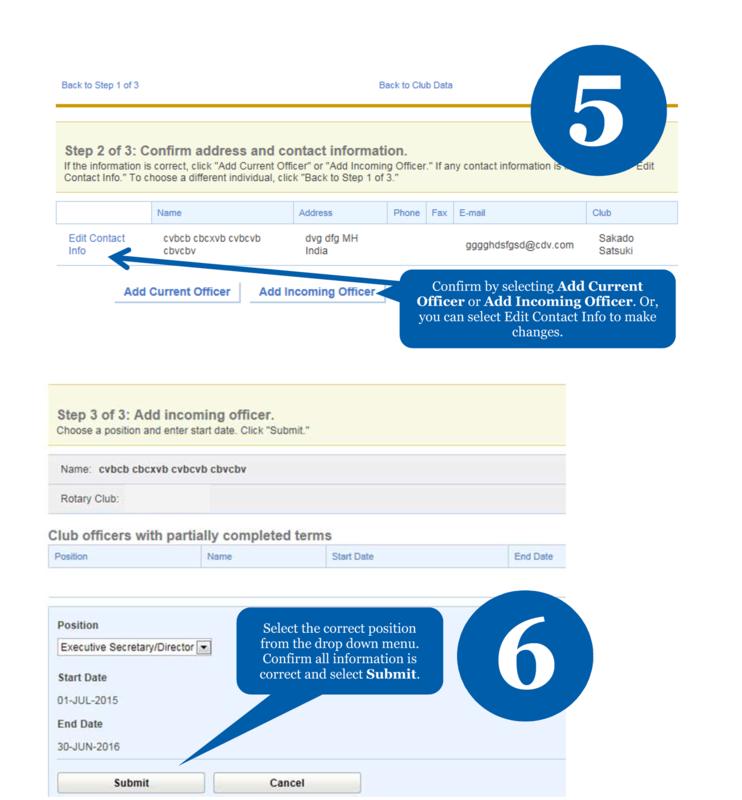 The second allows clubs flexibility in choosing their membership rules and requirements. Both passed. Representatives also approved removing six membership criteria from the RI Constitution and replacing them with a simple requirement that a member be a person of good character who has a good reputation in their business or community and is willing to serve the community. 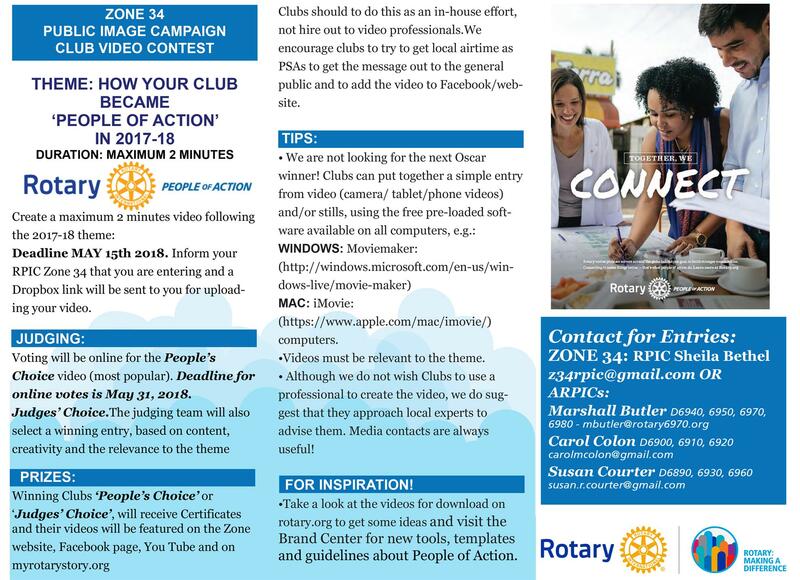 Interactors, Rotary wants you to show the world your club in action for the 8th annual Interact Video Awards! The “Best Video” will be awarded US$500 toward their next service project. Create a video that shows how Interactors have fun while making a difference and be recognized. 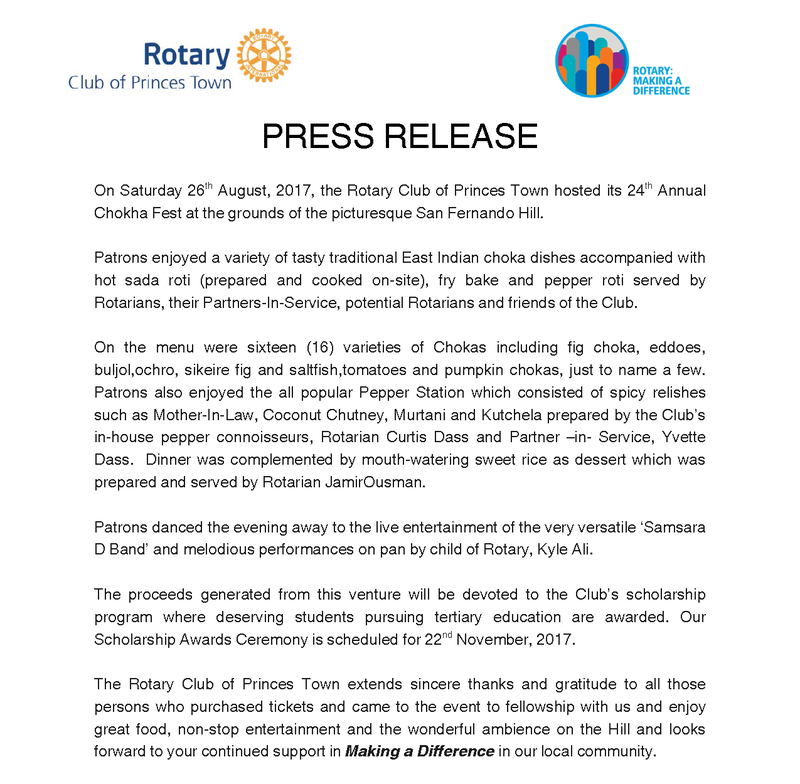 In October 2016, RC Princes Town set the bar in celebrating Diwali - the Hindu festival of lights - in the best Rotary traditions and demonstrated to other clubs in the District how to best work alongside and support your community. 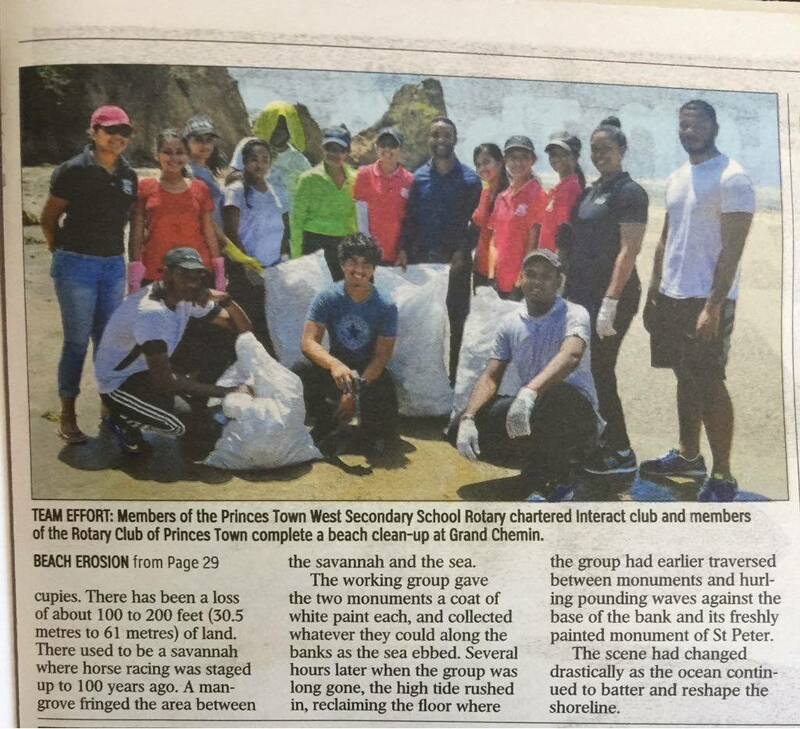 On Saturday 5th November 2016, in celebration of World Interact Week, students of the Interact Club of Princes Town West Secondary School, under the leadership of their Club President Alyssa Francis, engaged in a beach cleanup exercise at Moruga Beach, Trinidad. 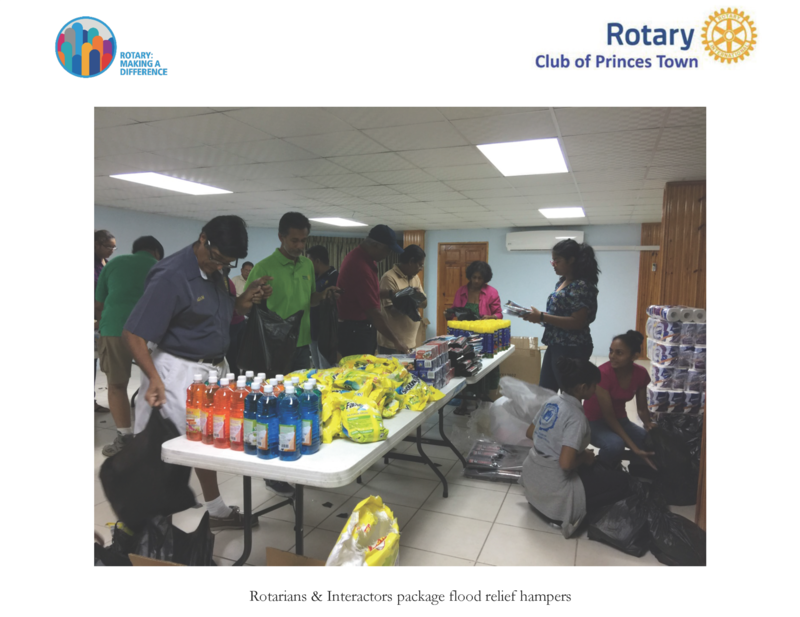 On Saturday 5th November 2016, under the leadership of President Debbie Roopchand, RC Princes Town continued to strive to fulfill this year's theme of "Rotary Serving Humanity" by conducting its third distribution of basic monthly supplies to the children of the Cerebral Palsy Society of Trinidad and Tobago. 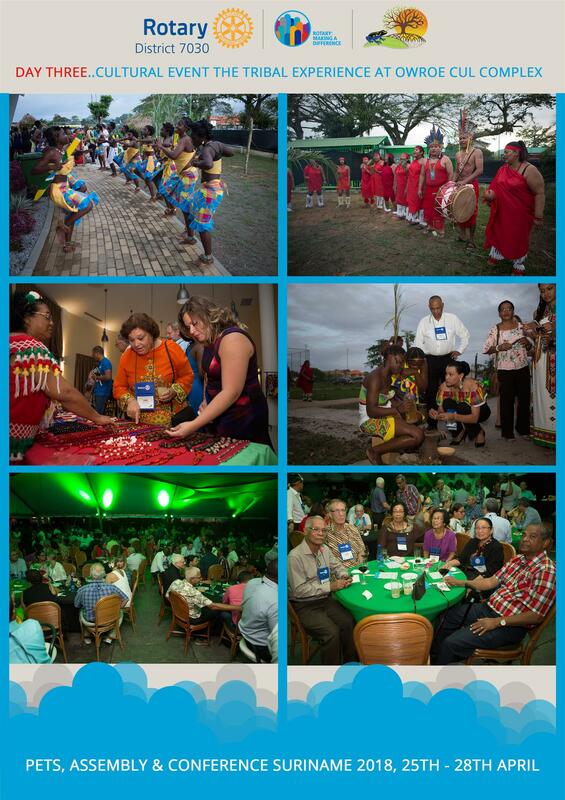 November is Rotary Foundation Month. 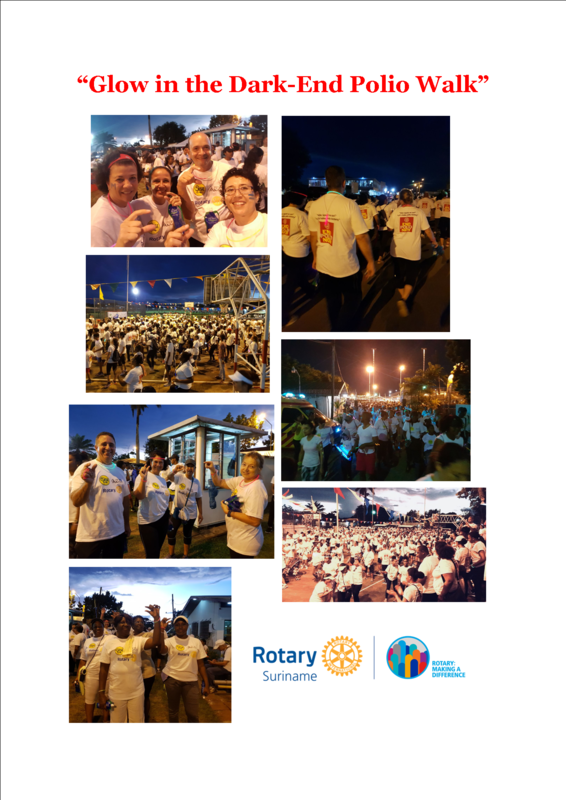 In District 7030, District Rotary Foundation Chair, PDG Hervé Honoré, would like D7030 Club and Rotarians to take a few minutes and genuinely reflect on what the Foundation really means...to them...to their club...to their community...and to the world. If you’ve ever waited … and waited … and waited for a check to arrive by mail, you know how excruciating it can be. Worse yet is when the check never arrives, lost in transit or delivered to the wrong address. One of the benefits of online charitable giving is that the wait time is virtually eliminated: You receive confirmation of the donation immediately and the nonprofit can start using your gift more quickly. Not surprisingly, the practice is growing. The Association of Fundraising Professionals has recognized The Rotary Foundation with its annual Award for Outstanding Foundation. 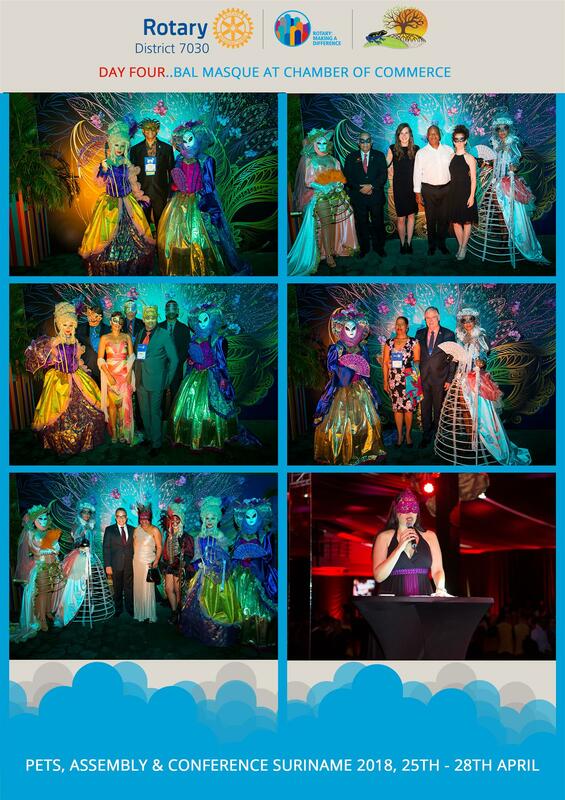 The award honors organizations that show philanthropic commitment and leadership through financial support, innovation, encouragement of others, and involvement in public affairs. 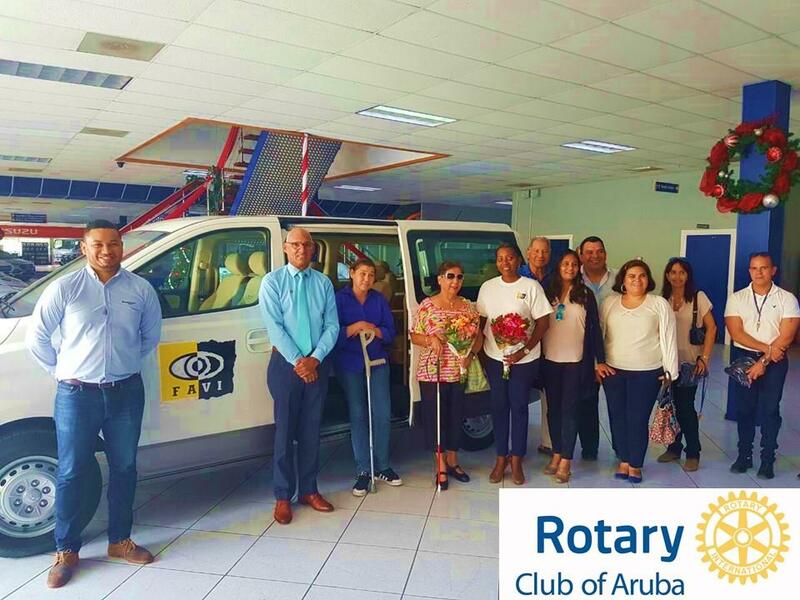 The Rotary Club of Aruba, together with other service clubs on Aruba, has donated the necessary funds to the foundation FAVI (Fundacion Arubano die esnan Visualmente Incapacita) in order to acquire a new bus. 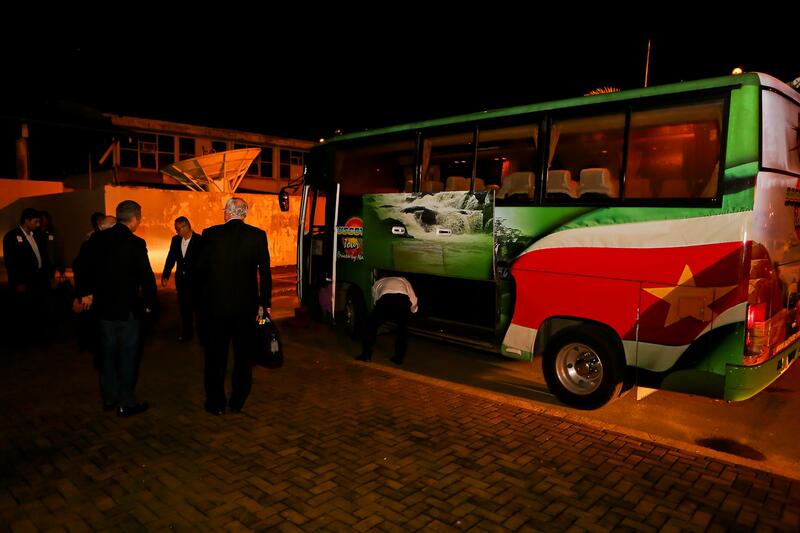 President Stanley Looman (second from left) was present at the delivery of this new bus. FAVI is a foundation that helps and guides the visually impaired and the blind. 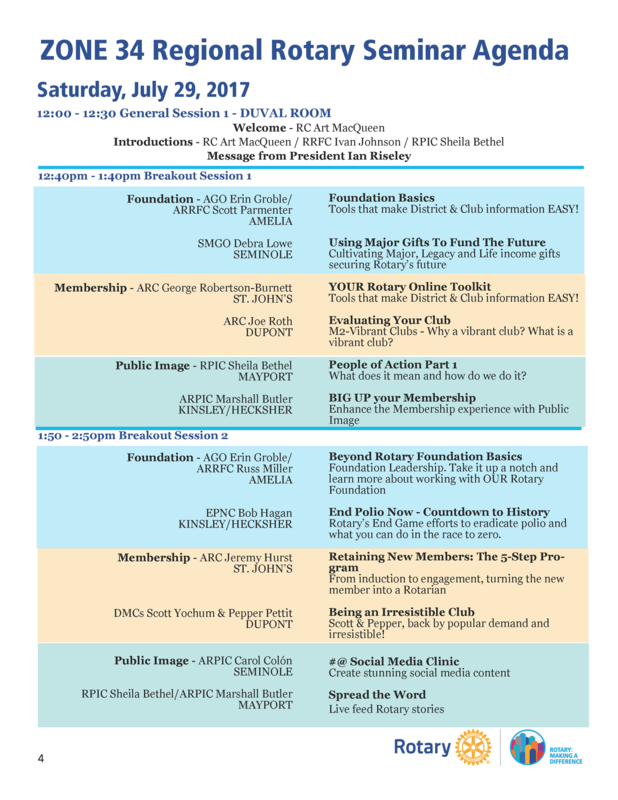 Come celebrate the 100th Anniversary of the Rotary Foundation in Atlanta. 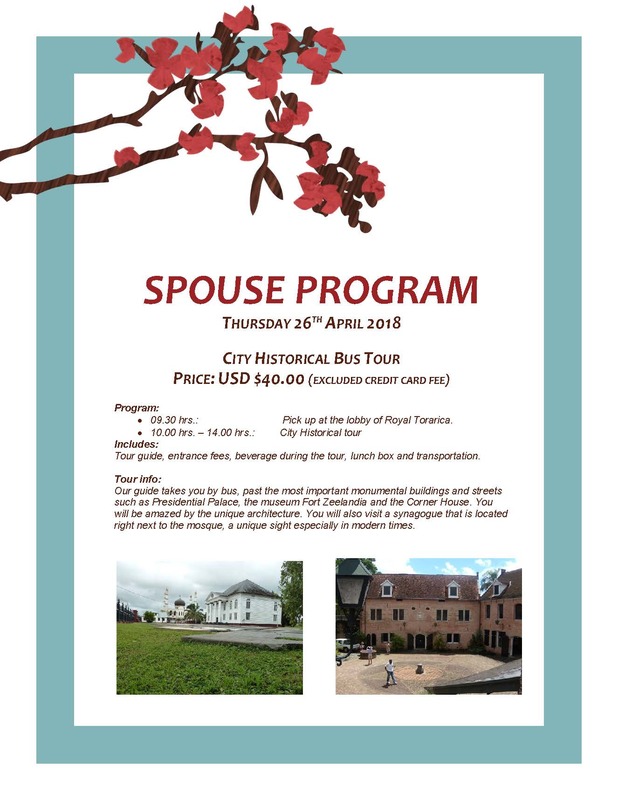 Special registration rates are still being offered. 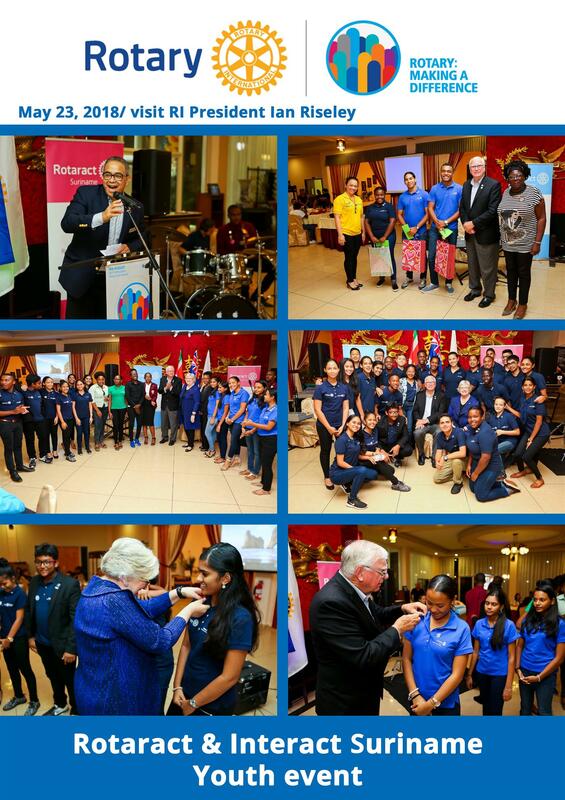 On Friday 25th November, the first Interact Club of Aruba was installed!! 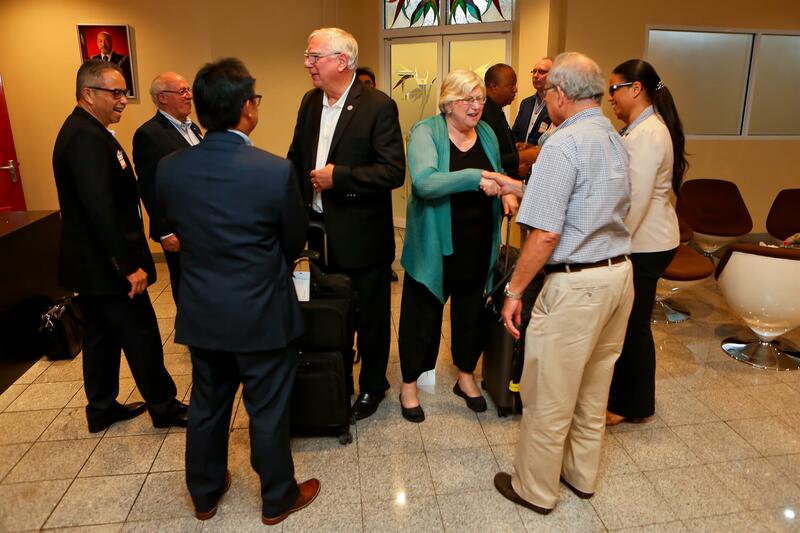 A total of 21 members were pinned by former Rotary International Director Mrs. Julia Phelps. 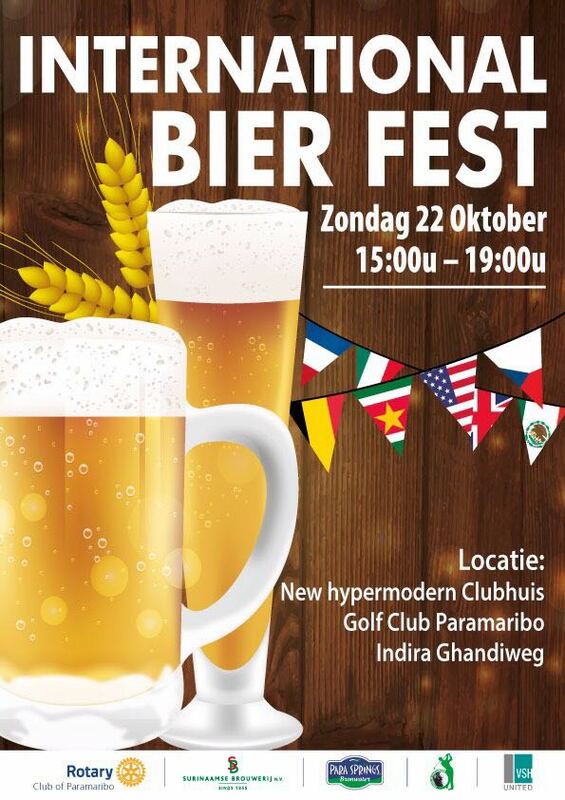 The Interact Club of Aruba was chartered on October 3rd, 2016. November 29th, 2016 is carded as Rotary's 'Give Back Tuesday' - a day we as Rotarians should all take account of our contributions to the The Rotary Foundation (TRF) and the work it does. 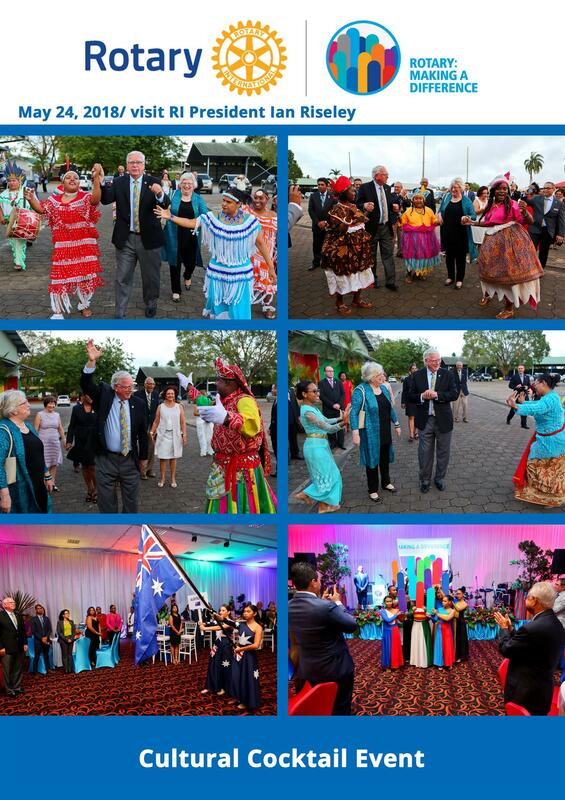 To end the TRF month of November, PDG David Edwards – District 7030 TRF Fundraising Chair – has produced some inspiring and relevant information on contributing towards TRF. 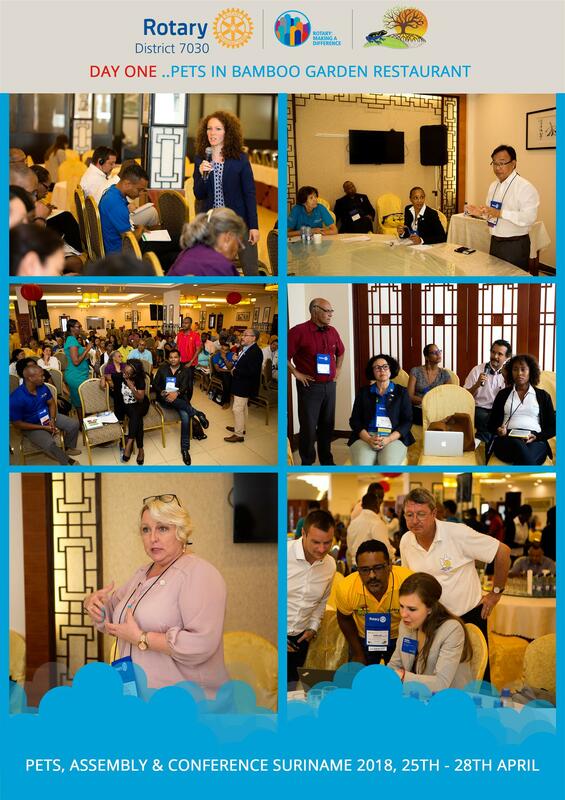 Many Rotarians may not be aware of how the TRF systems work either at an international or district level and are encouraged to review the material herein. 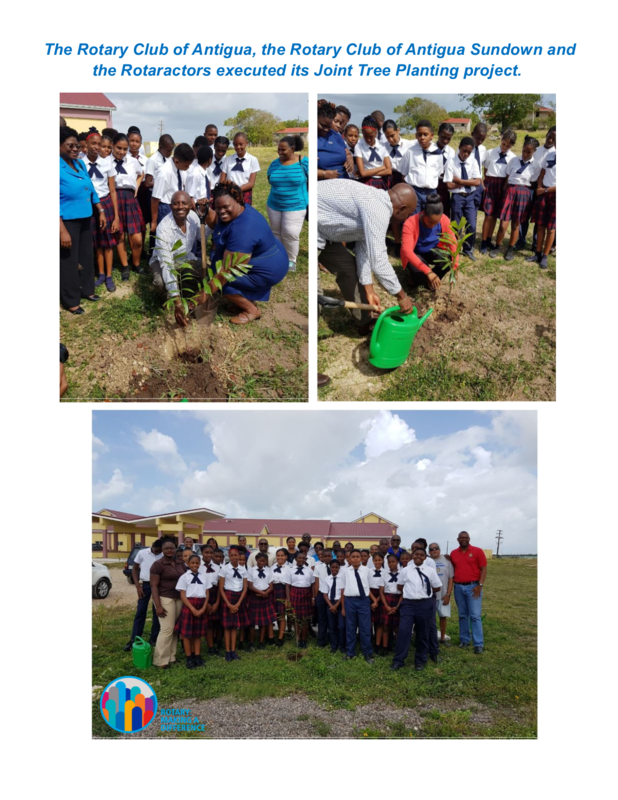 On Wednesday 23rd November 2016, at a joint meeting with the Rotary Club of Pointe-a-Pierre and with District Governor Roger Bose in attendance, the Rotary Club of Princes Town awarded a total of TT $75,000 (over US $11,000) to 9 students towards assisting them in pursuing their tertiary level studies. 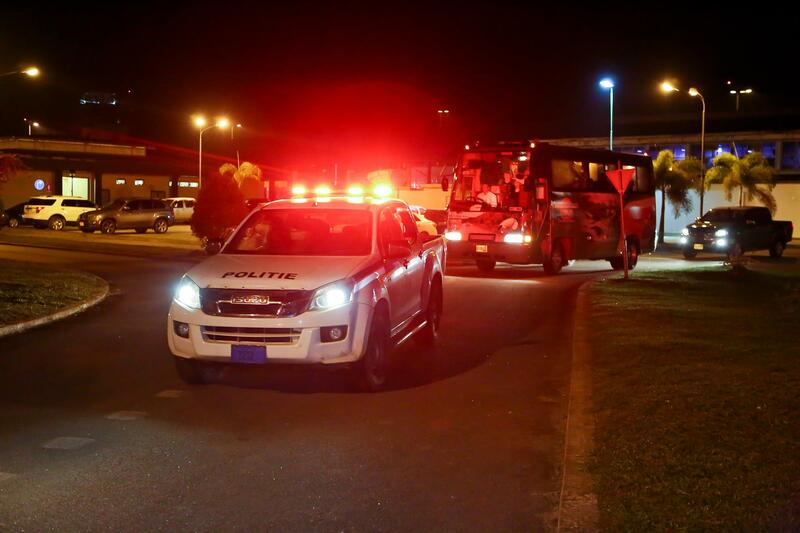 The students were past students of schools which fall under the Club’s jurisdiction - Biche High School, Tableland High School, Moruga Secondary School, Princes Town West Secondary School, Cowen Hamilton Secondary School and St. Stephen's College. 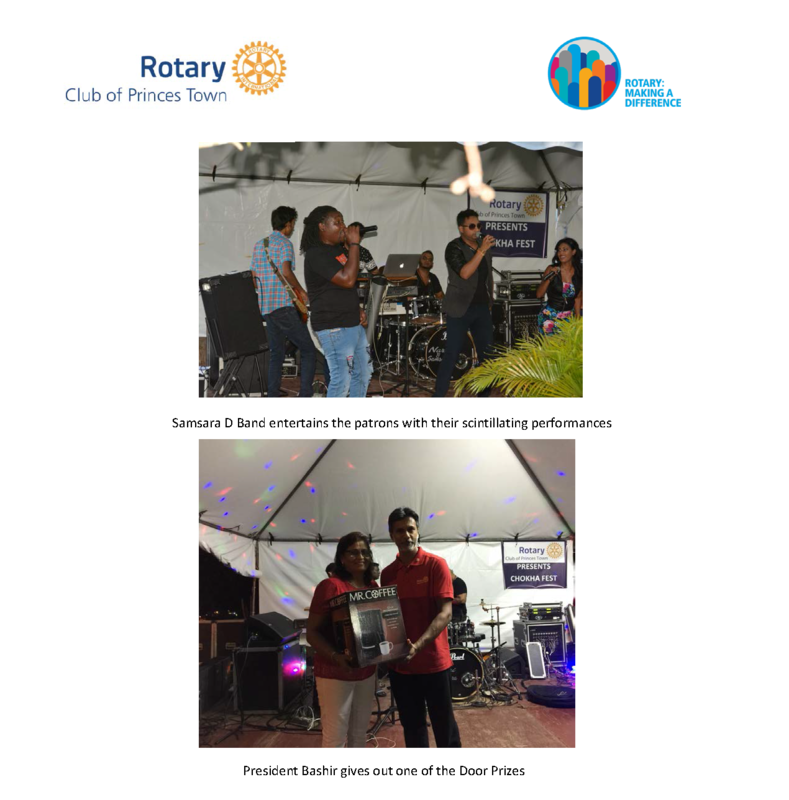 On 4th December 2016, on a small playing field in Moruga, Trinidad, the Rotary Club of Princes Town conducted its annual Christmas treat at Samuel Cooper Trace. 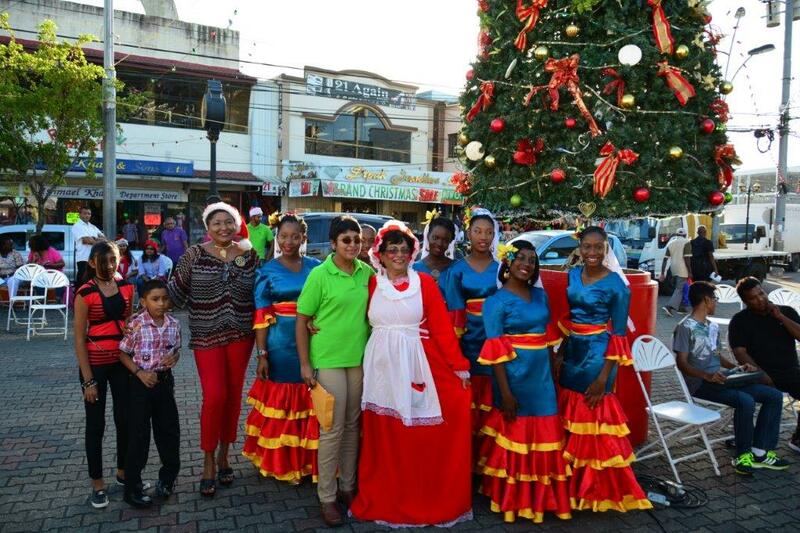 The Club distributed toys and treat bags to 191 children and hampers to 12 residents. 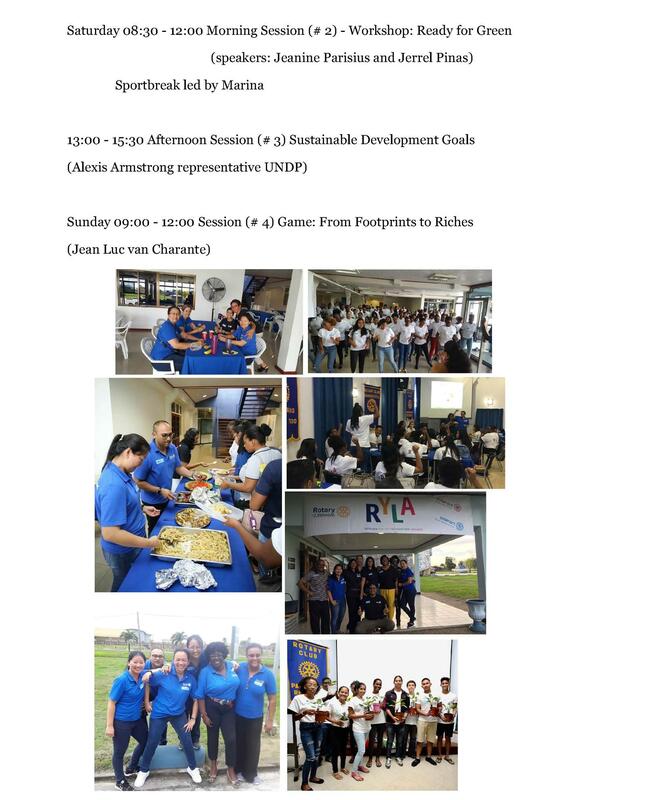 During late November 2016, the Rotary Club of Stabroek partnered with the Peace Corps Guyana to host Bagotville's first CAMP BRO project at the Bagotville Community Centre. 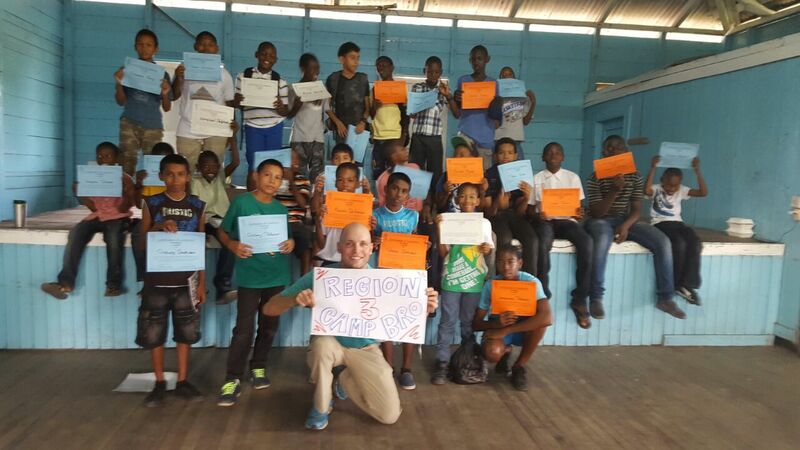 The concept of Camp Bro developed by Peace Corps Guyana is a project to develop character in young boys and was initially implemented as a one day camp for boys aged 9 to 14 year old and geared to make significant impact in their social lives. 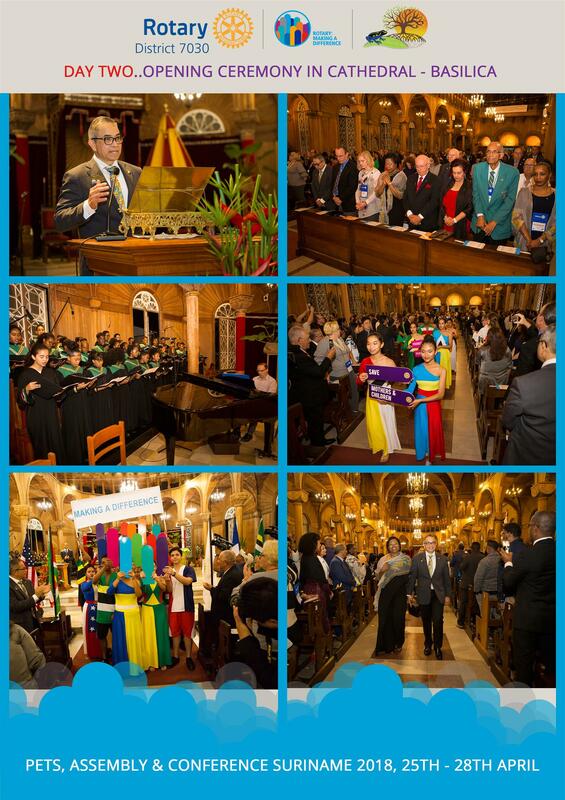 For the third consecutive year the Rotary Club of Maracas/St. 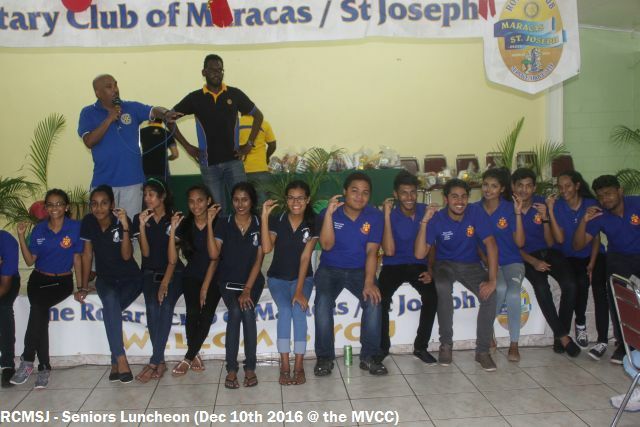 Joseph (RCMSJ), in partnership with the Interact Clubs of Hillview College and St. Joseph Convent, St. Joseph, was host to an exquisite Christmas Style Gala Luncheon for the Senior Citizens of the Maracas, St. Joseph community. 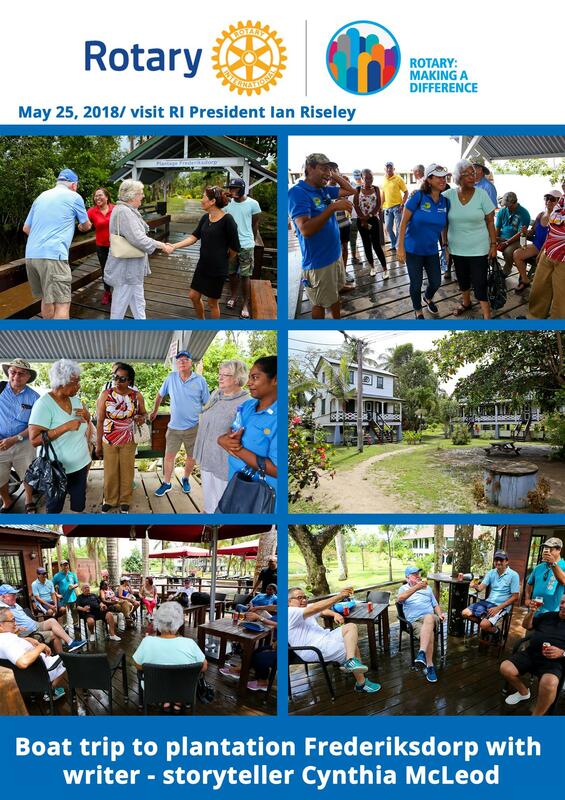 The event was held on Dec 10th 2016 at the Maracas Valley Community Center and was favourably supported by several Community Councils in the Valley namely the Lluengo Community Council, Acono Community Council, Maracas Valley Community Council and the La Seiva Community Council, to this end they were all equally responsible for inviting the Seniors Citizens and ensuring maximum participation and attendance to the event. 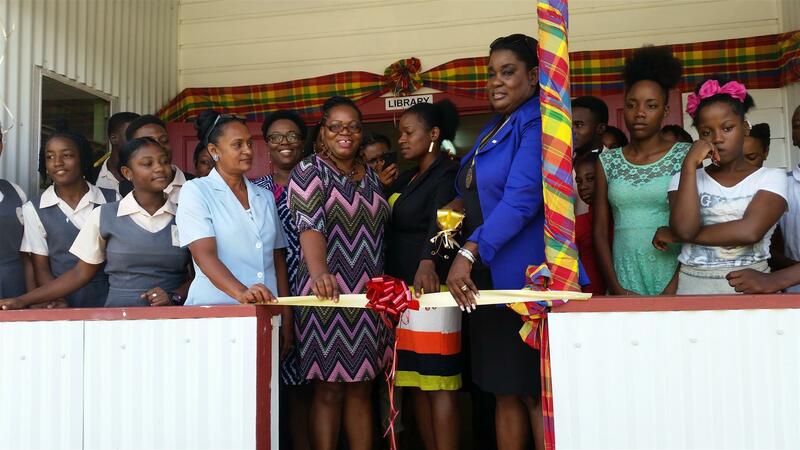 On December 7, 2016 the library at the Micoud Secondary School was officially opened providing the nearly 700 students with a beautiful, modern, fully-stocked resource of the newest and best in reference, fiction, and non-fiction titles. 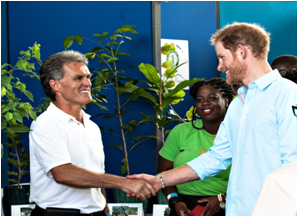 During his official visit to Saint Lucia in November 2016, His Royal Highness, Prince Harry of Wales, met with 8 local community organizations, including a group comprised of over 30 Rotarians, Rotaractors and Interactors. 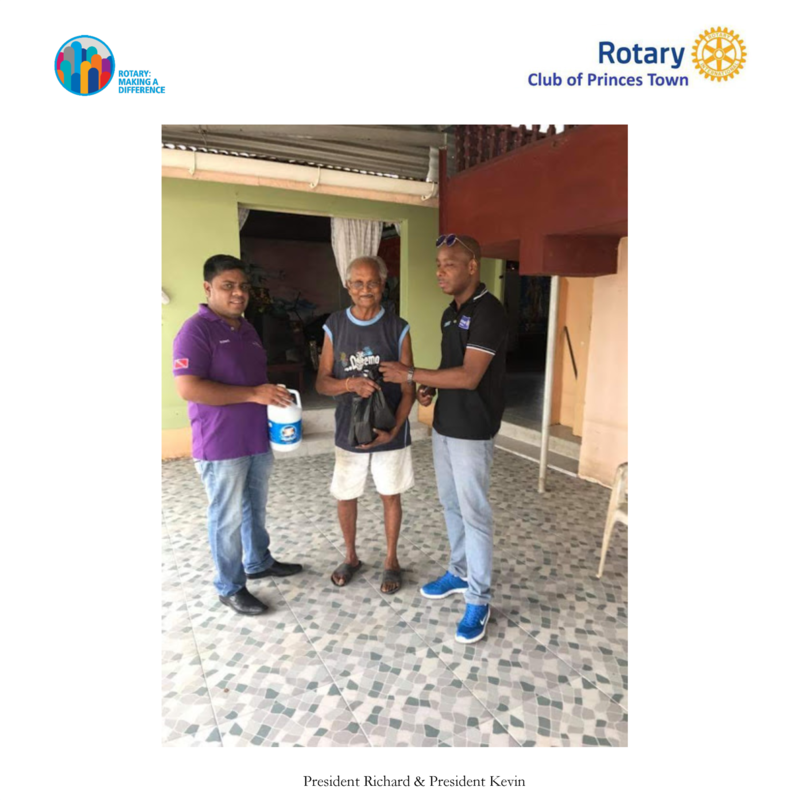 On 14th December 2016, RC Remire Montjoly held its annual Arbre de Noël event which consists of distributing gifts and a cheer to the children of a school French Guiana. 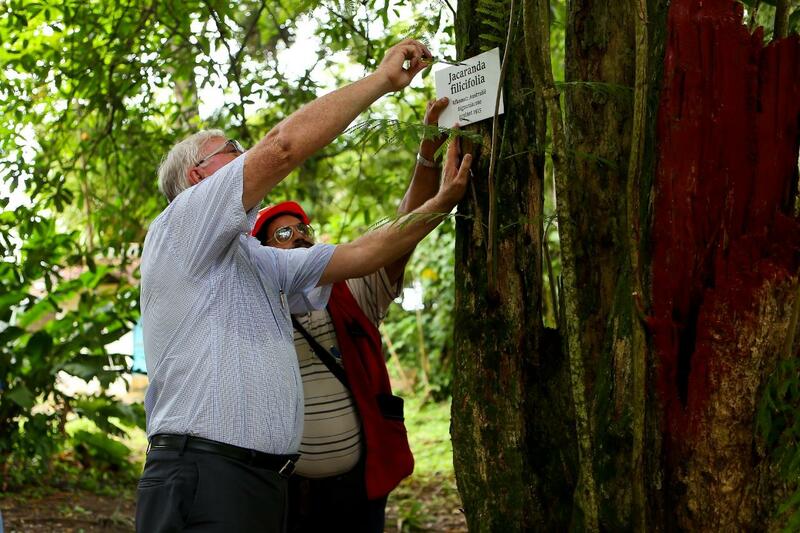 « Arbre de Noël » du ROTARY CLUB de REMIRE MONTJOLY (Guyane Française) du 14 décembre 2016. Cette action qui est reproduite chaque année consiste à distribuer de cadeaux et un gouter aux enfants d’une école de la commune de REMIRE MONTJOLY (Guyane Française). 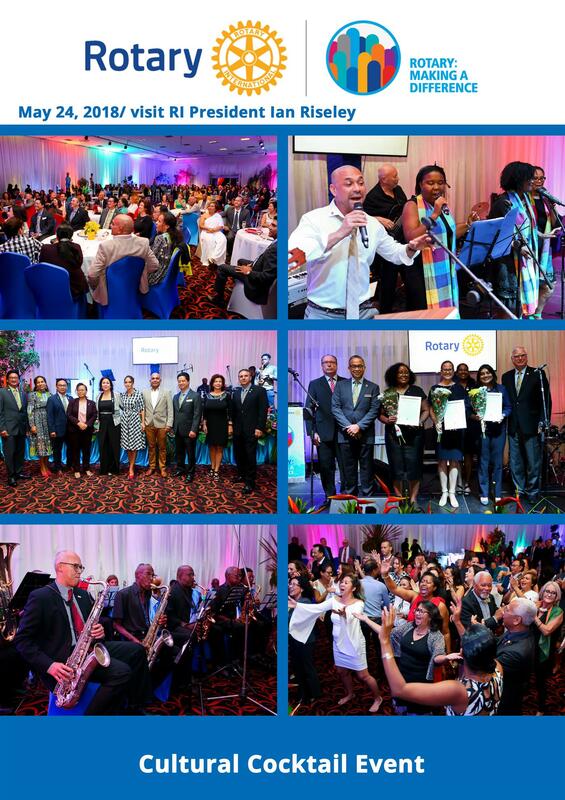 On Thursday 15th December 2016, the Rotary Club of Princes Town hosted a 3-hour Christmas concert at the Triangle, Princes Town. The concert started a little after 4:00 p.m. and President Debbie Roopchand who chaired the concert spoke of the Club’s delight in being able to put together the show at no cost to the members of the public in an effort to bring them Christmas cheer. 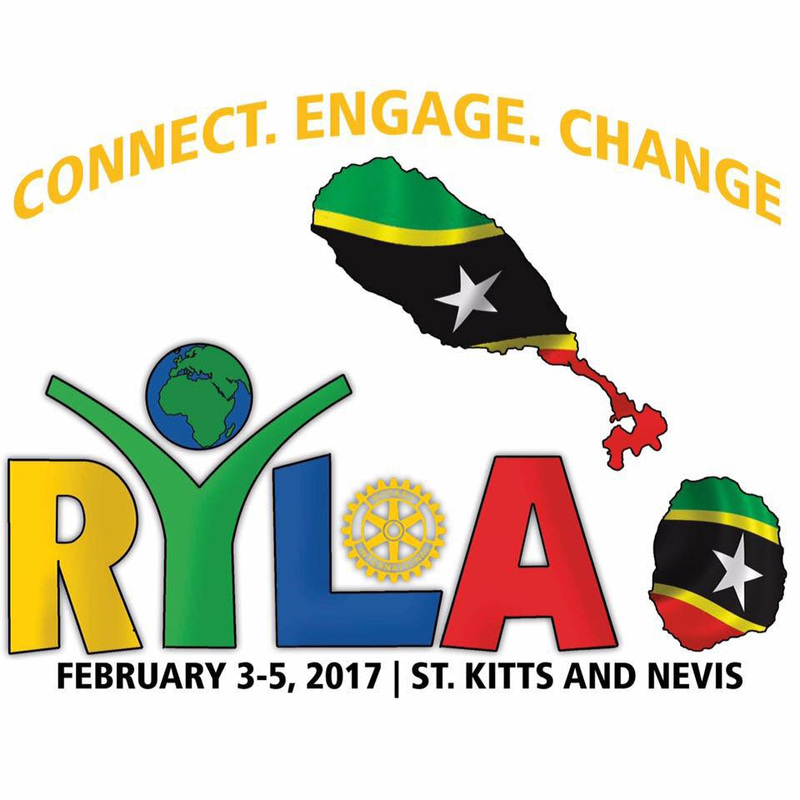 The early registration deadline for RYLA 2017 is quickly approaching <January 11th 2017>. 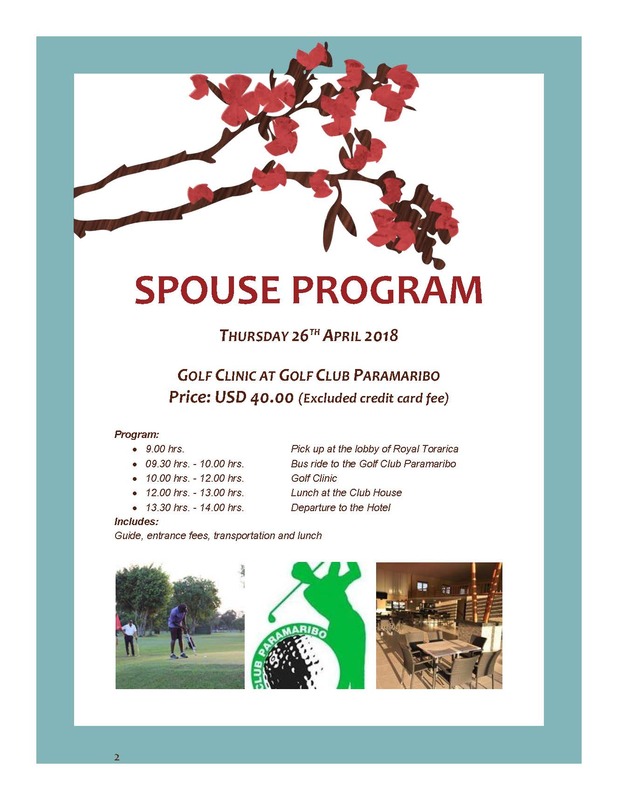 Clubs are encouraged to register their participants as soon as possible to take advantage of the discounted price. 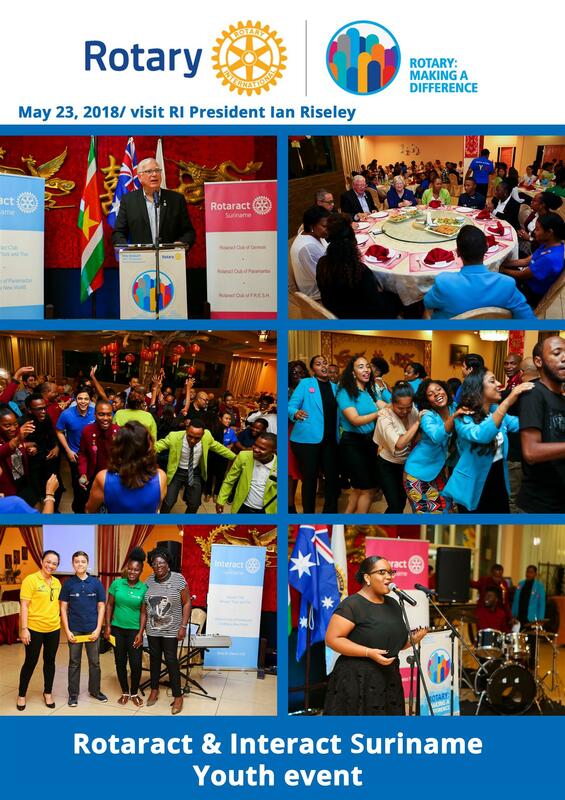 Please remember this year's age range of 14-30 when selecting your participants from Rotaract and Interact. 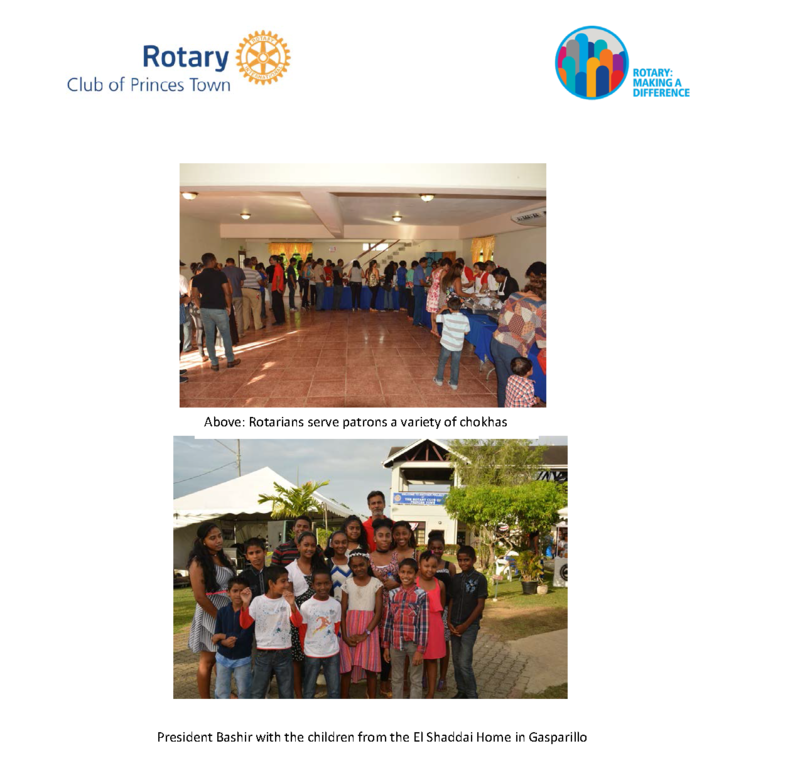 On 19th December 2016, the long standing St. Lucia Rotary tradition of hosting a Children's Christmas party for primary school kids continued in Augier, in south Saint Lucia. 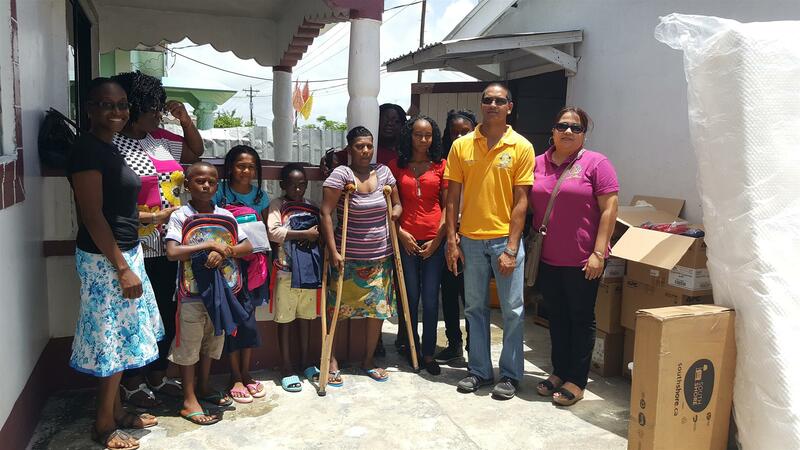 Once again members of the St. Lucia Rotary and Rotaract Clubs teamed up to deliver Christmas cheers to school children who were engaged in singing and playing before Santa Claus delivered presents to each of the 88 students. It's Official!! 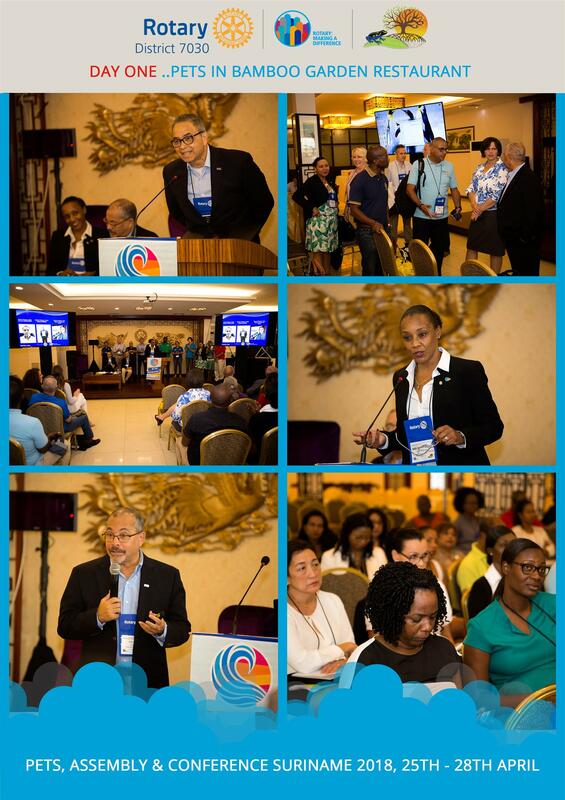 The ABC Islands have joined District 7030!! As of January 1st, 2017, the culmination of a process that began several years ago is now upon us. 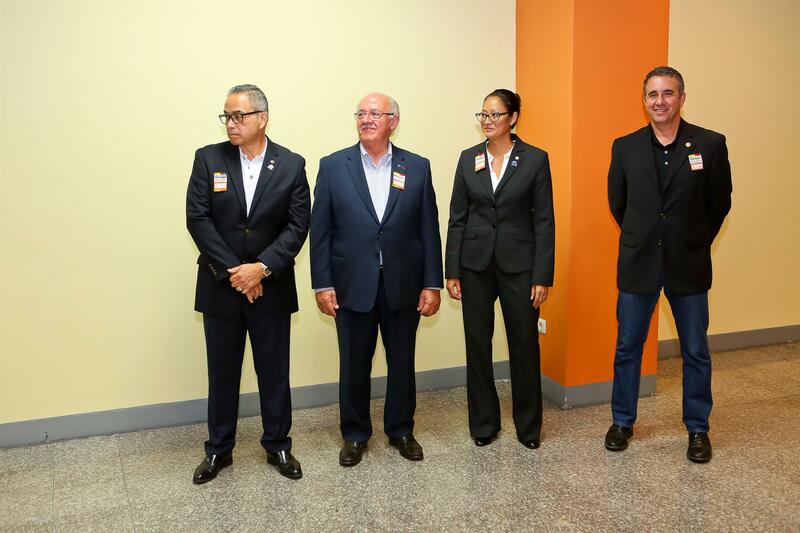 It is very rare for a District to “adopt” 3 new countries and 4 new clubs into its fold, but that’s exactly the event about which District 7030 is so ecstatic.